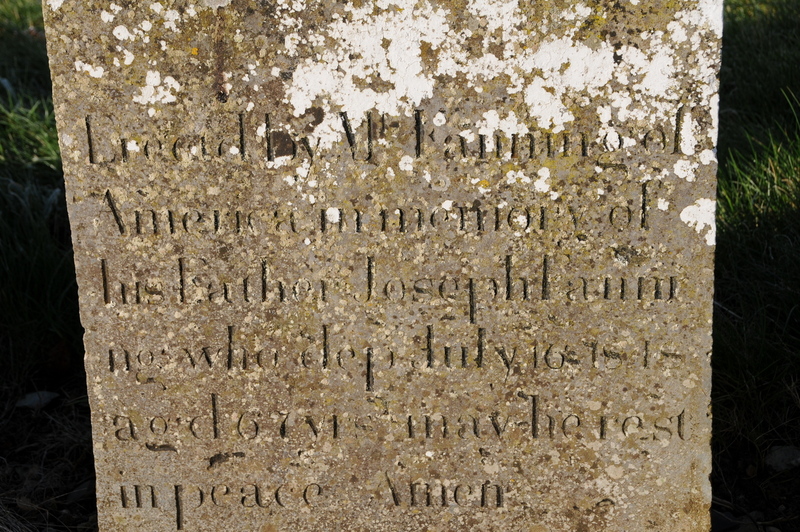 Gravestone inscription for JOHN FANNING of Cloughmartin, who died age 78, 17 Apr 1986. Brother of Elizabeth Fanning, son of Michael and Johanna Fanning and the nephew of Kate Ryan. Buried in Moycarky Old Graveyard. Gravestone inscription for THOMAS FANNING of Skehana, died 14 Dec 1922. Husband of Margaret Fanning, father of Martin Fanning, brother of Joseph Fanning & uncle of William & John Fanning. Buried in Moycarky Old Graveyard. Gravestone inscription for JOSEPH FANNING of Skehana, died 15 Jul 1941. Brother of Thomas Fanning. Father of William & John Fanning. Buried in Moycarky Old Graveyard. Gravestone inscription for MARTIN FANNING of Skehana, died 7 Mar 1951. Son of Thomas & Margaret Fanning, nephew of Joseph Fanning & cousin of William & John Fanning. Buried in Moycarky Old Graveyard. Gravestone inscription for MARGARET FANNING of Skehana, died 21 Aug 1957. wife of Thomas Fanning, mother of Martin Fanning. Buried in Moycarky Old Graveyard. 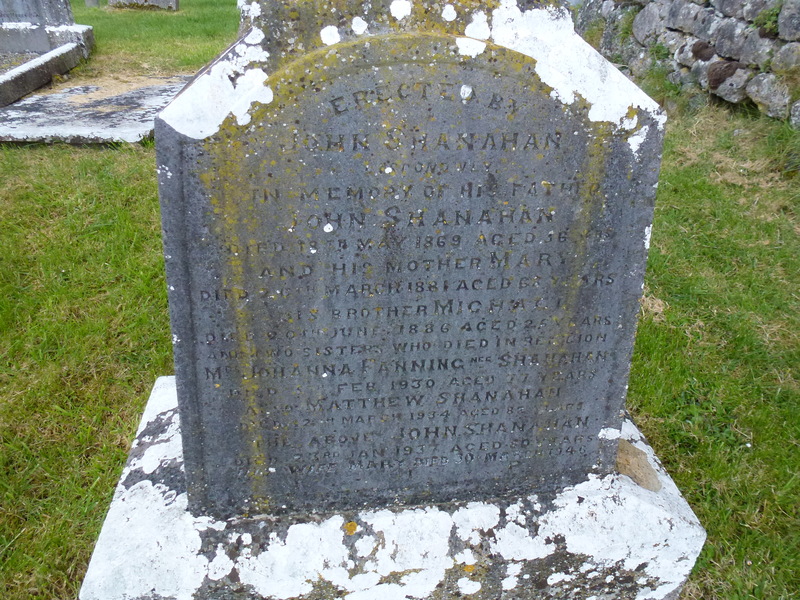 Gravestone inscription for WILLIAM FANNING of Skehana, died 4 Oct 1977. Son of Joseph Fanning, brother of John Fanning, nephew of Thomas Fanning & cousin of Martin Fanning. Buried in Moycarky Old Graveyard. 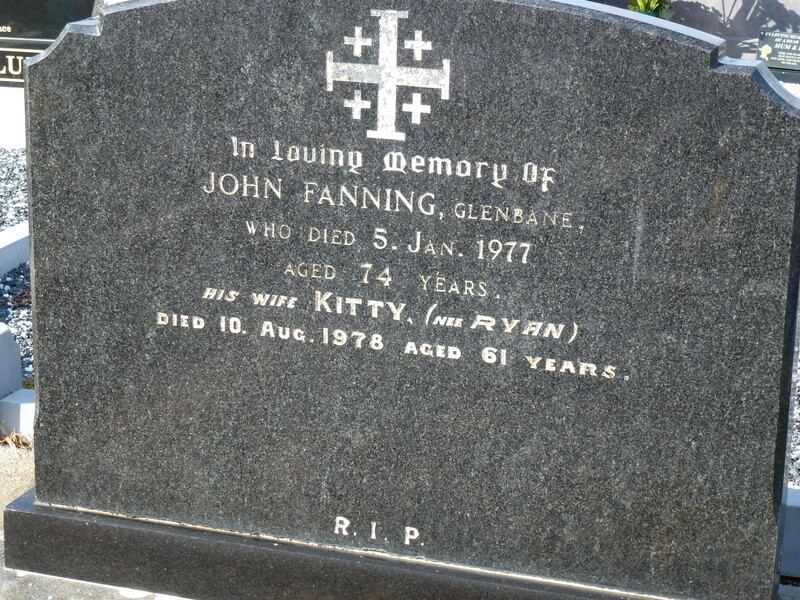 Gravestone inscription for JOHN FANNING of Skehana, died 28 Apr 1982. Son of Joseph Fanning, brother of William Fanning, nephew of Thomas Fanning & cousin of Martin Fanning. Buried in Moycarky Old Graveyard. Mary Hogan nee Sheehan was Big Bill’s niece, her mother was Sally Sheehan nee Fanning. Mrs Ed Fanning of Shanbally was her sister Johanna Mrs John Fanning of Clondoty Loughmore was her sister Mary. Mrs O’Donnell of Fethard would have been her aunt Johanna nee Sheehan and Mrs Fanning of Thurles was most likely her aunt Ellen nee Sheehan who was a shopkeeper and publican in Quarry St Thurles. 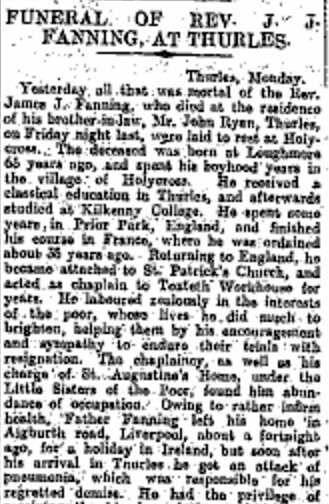 The Bridget Hogan who died in 1982 may well be the Bridget Hogan of Coolkip mentioned in the paper, probably the niece of the Bridget who died in 1928. 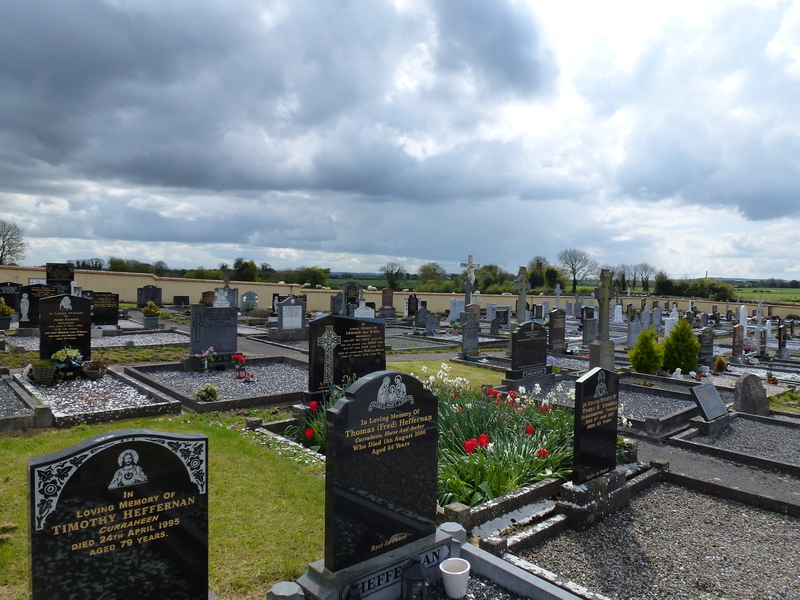 Mary Fanning nee Darmody’s relatives are buried in Ballycahill Cemetery and Roger Fanning’s relatives are in the old Church of Ireland Cemetery Holycross. These are the three graves that are shown in close up above. 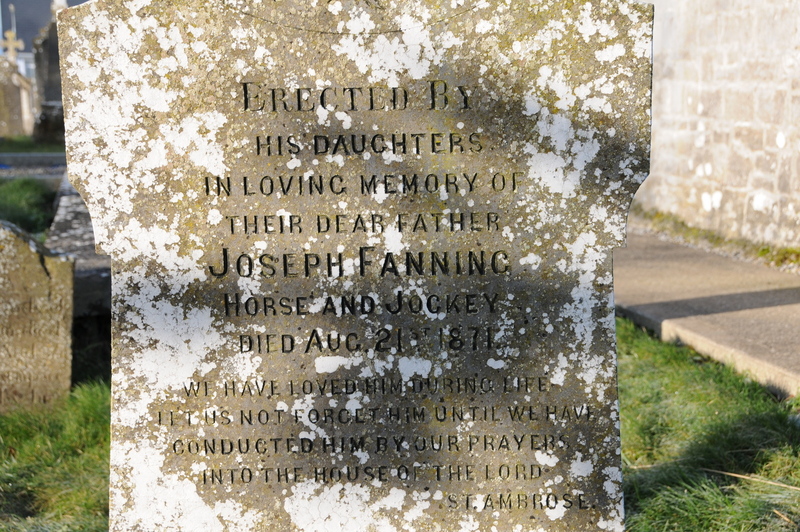 From left to right is the grave of Joseph Fanning of Moycarkey, then the grave of Joseph Fanning, erected by his brother from America and lastly that of Joseph Fanning of Horse and Jockey, erected by his loving daughters. 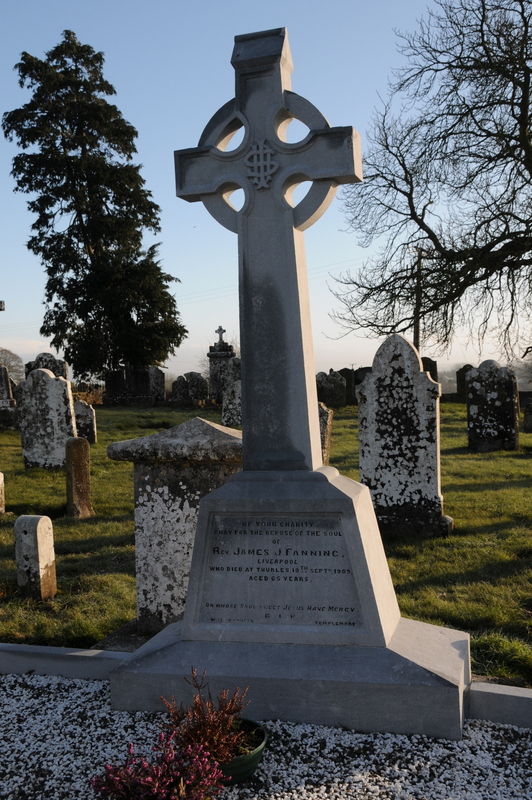 Joseph Fanning of Graigue Moycarky Holycross Church of Ireland Cemetery died 27 July 1895. Husband of Mary, father of Patridk, John, William, Daniel, James, Margaret & Mary Anne. Erected by Joseph Fanning of Ballytarsna. Daniel of Graigue Moycarky died 16 Oct 1904; John of Graigue Moycarky died 18 Jan 1905; Mary died 26 Jan 1913; Patrick died 5 Dec 1928 & Margaret died 13 Mar 1902. Joseph Fanning of Horse & Jockey Holycross died 21 Aug 1879. Erected by his loving daughters. Gravestone Inscription for Catherine Fanning nee Doyle, buried in Holycross Old Graveyard. Died 4 Sept 1926, age 60. Address Holycross. Erected by James Doyle of Glenreigh, her brother. WILLIAM FANNING,6 Mar 1866, age 71, Civil death record, Parish/district of Dunkerrin. William was the husband of Ellen and father of Mary. WILLIAM FANNING, 19 Jun 1895, age 34, Civil death record, Parish/district of Roscrea. 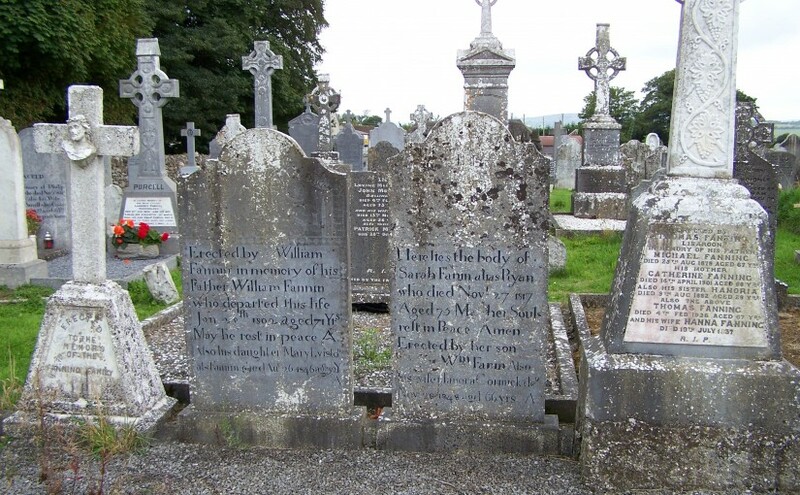 William was the son of Mary & Martin Fanning & brother of Mary Ellen & Thomas Fanning Buried in St Cronans RC Graveyard. 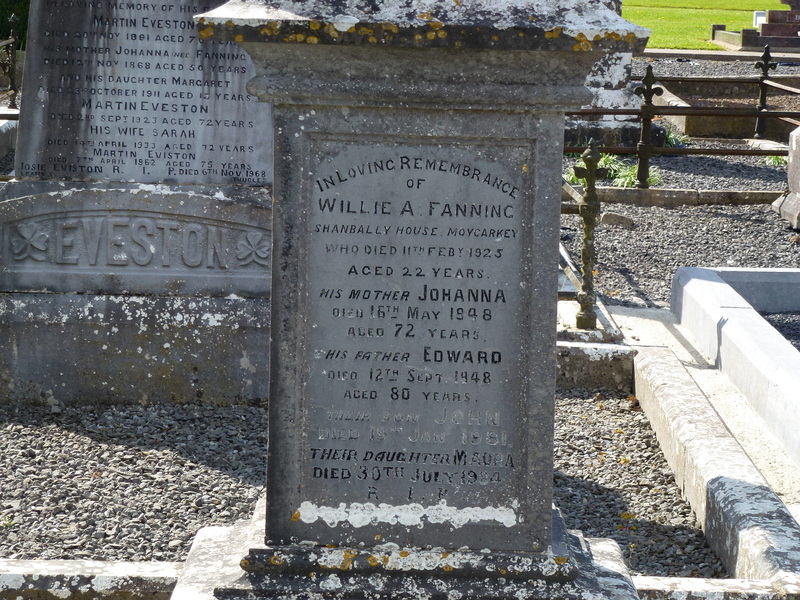 WILLIAM FANNING, 24 Dec 1876, age 31, Lisdonowly, farmer’s son, bachelor. Informant James Fanning, Lisdanowly. Civil death record, Parish/district of Moyne. ELLEN FANNING,17 May 1880, age 66, Main St Thurles, shopkeeper, spinster. 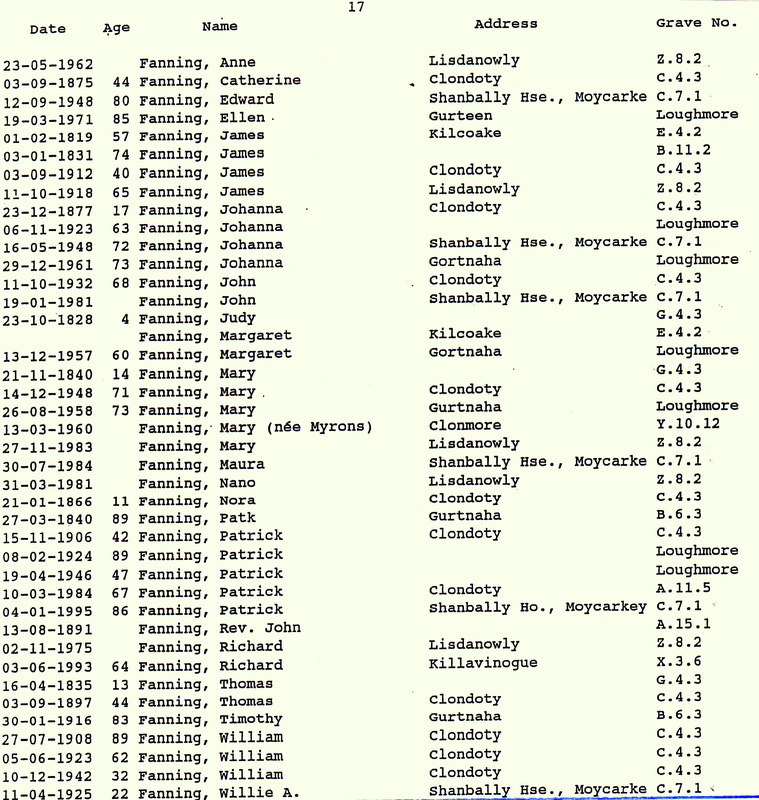 Informant Patt Fanning, Main St. Civil death record, Parish/district of Thurles. EDWARD FANNING,19 Mar 1903, age 63, Jail St Thurles, shopkeeper, bachelor. Informant Mary Quinlan Jail St Civil death record, Parish/district of Thurles. WILLIAM FANNING, 28 Dec 1869, age2, Borris, farmer’s son, Informant Martin Fanning, Borris. Civil death record, Parish/district of Littleton. JOHN FANNING, 2 Apr 1867, age 74, Pudding Lane Thurles, bachelor, mercantile clerk. Informant Edward Fanning of Pudding lane. WILLIAM FANNING, 24 Mar 1884, age 40, Gurtnahaha, bachelor, farmer, Informant John Cormack Co Tipp coroner. Suicide. Civil death record. Parish/district of Moyne. 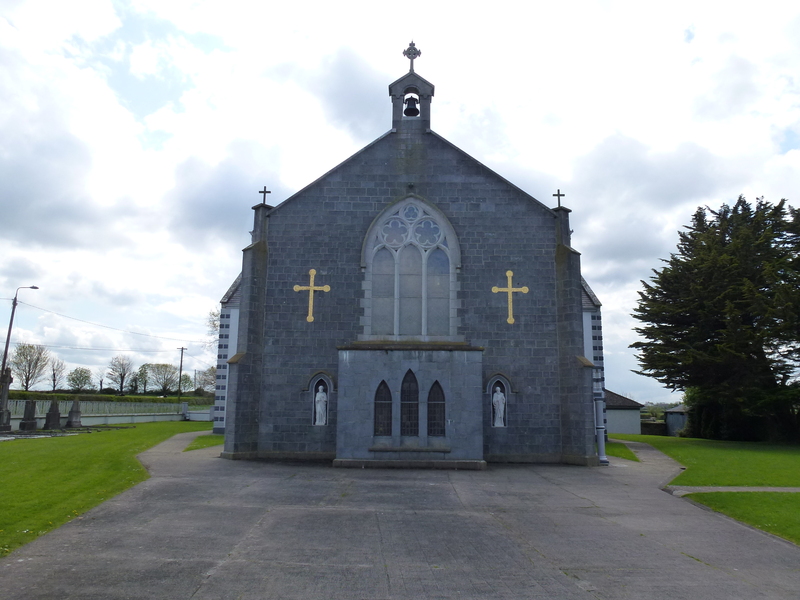 WILLIAM FANNING,10 Apr 1899, age 86, Gortnagoona, Parish of Killavinogue, farmer, married. Informant his son, William Fanning, Gortnagoona. Civil death record, Parish/district of Bourney. WILLIAM FANNING, 17 Mar 1900, age 2 months, Gortuagoona, Parish of Killavinogue, farmer’s child. Informant his father, William Fanning. Civil death record, Parish/district of Bourney. WILLIAM FANNING, 22 Feb 1907, age 7 days, Gurtree, farmer’s child. Informant his mother, Mary Fanning. 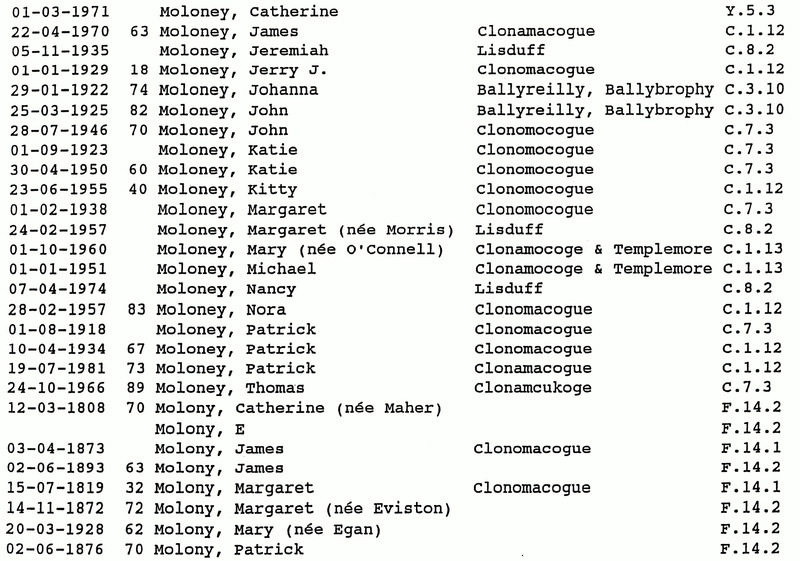 Civil death record, Parish/district of Moyne. 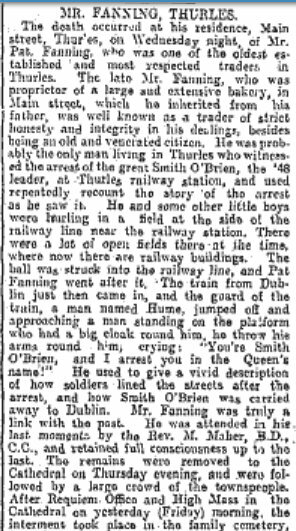 MICHAEL FANNING, 15 Aug 1866, age 5, Lisdonowly; informant his father Patrick Fanning. Parish/district of Moyne, civil death record. EDWARD FANNING, 9 Dec 1900, age 4 months, Coolcrue. Informant his father Ed Fanning Coolcrue. Parish/district of Littleton. SARAH FANNING, 2 Sept 1893, age 75, spinster, Coldfields. Parish/district of Littleton. Informant John Fanning, her nephew, Coldfields. Civil record. 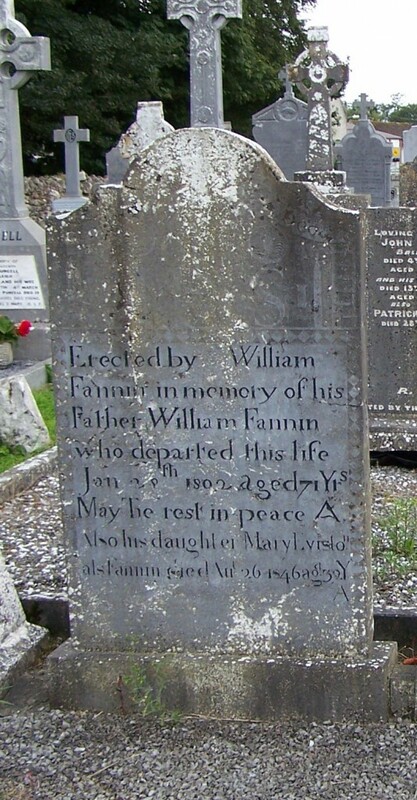 WILLIAM FANNING died in the parish of Templemore on 13/3/1901 age 70 from influenza. His address was Kilvilcorris and he was a farmer and married. The informant was his wife, Anny Fanning of Kilvilcorris. MARGARET FANNING died Dec 20 1883 aged 74. Her address was Castletown in the Parish of Littleton. She was a farmer’s widow. Her son Thomas Fanning, also of Castletown, was the informant. JOHN FANNING died in the parish of Templemore on 15/8/1873 age 36 from dysentery His address was Kill and he was a farmer and a bachelor. The informant was William Fanning of Kill. His relationship to the deceased is described as householder. JOHN FANNING died in the parish of Templemore on 23/7/1875 age 23 from heart disease His address was Drom and he was a farmer and a bachelor. The informant was Mary Fanning of Drom. Her relationship to the deceased is described as householder. JOHN FANNING died in the parish of Templemore on 7/12/1876 age 84 from old age. His address was Drom and he was a farmer and married. The informant was Margret Fanning of Drom. Her relationship to the deceased is described as householder. 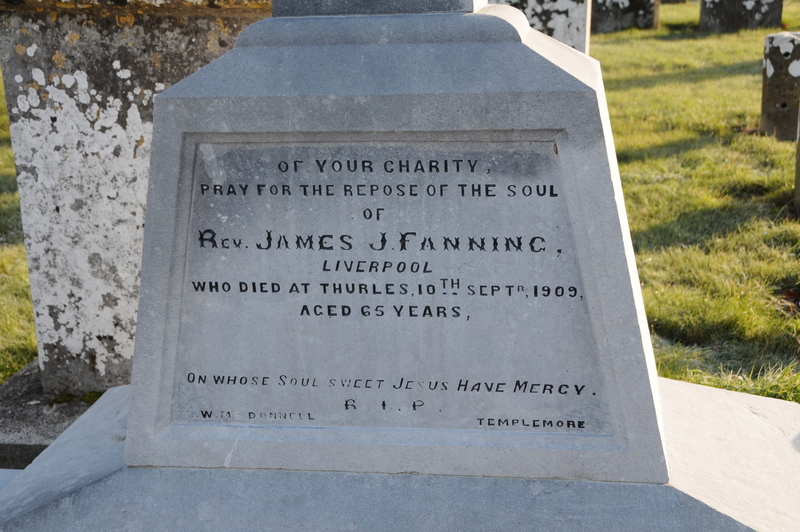 JOHN FANNING died in the parish of Templemore on 25/2/1899 age 18 from a malignant pelvic tumour and asthenia. His address was Drom and he was a farmer’s son and a bachelor. The informant was William Fanning, his father, of Drom. 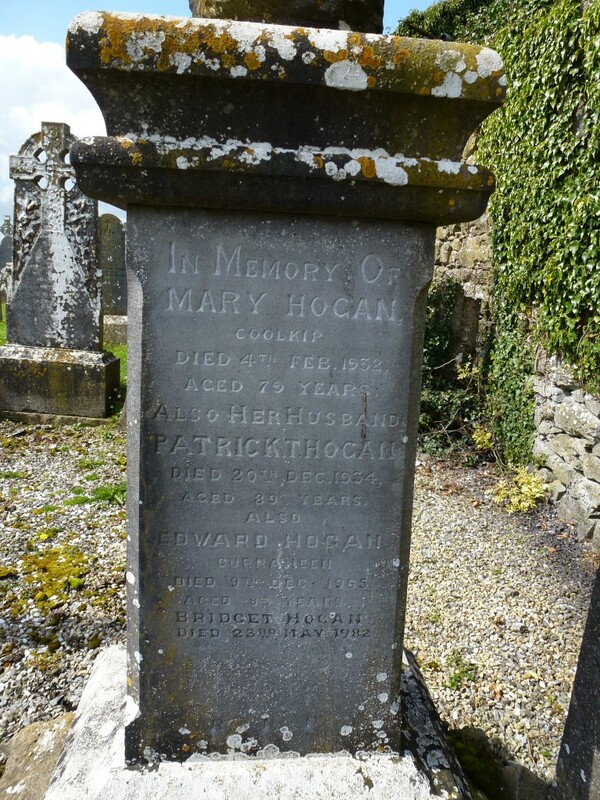 Gravestone Inscription: HONORIA MULCAHY date of death: 7 Sept 1882 age 37 address: Thurles. 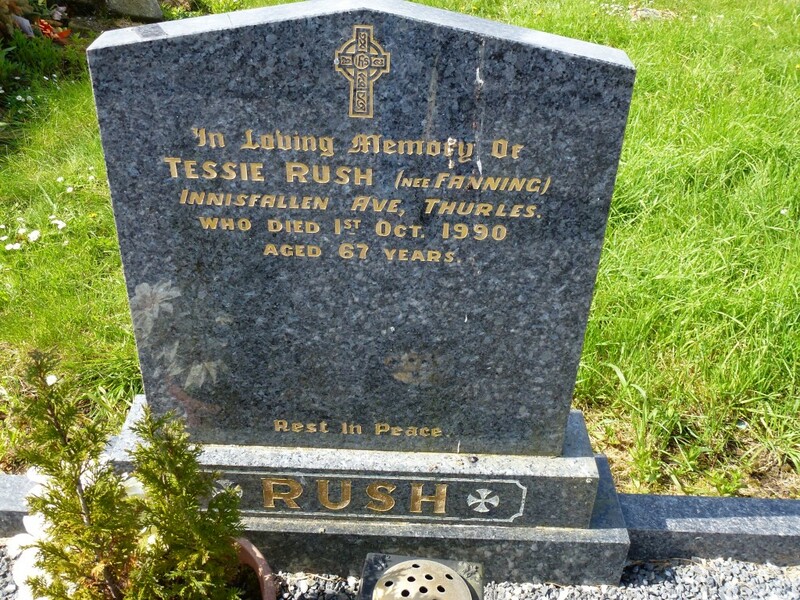 She was a nun and buried in the Ursuline Convent Graveyard Thurles. Her name was Sister Mary Baptist, professed 11 years. 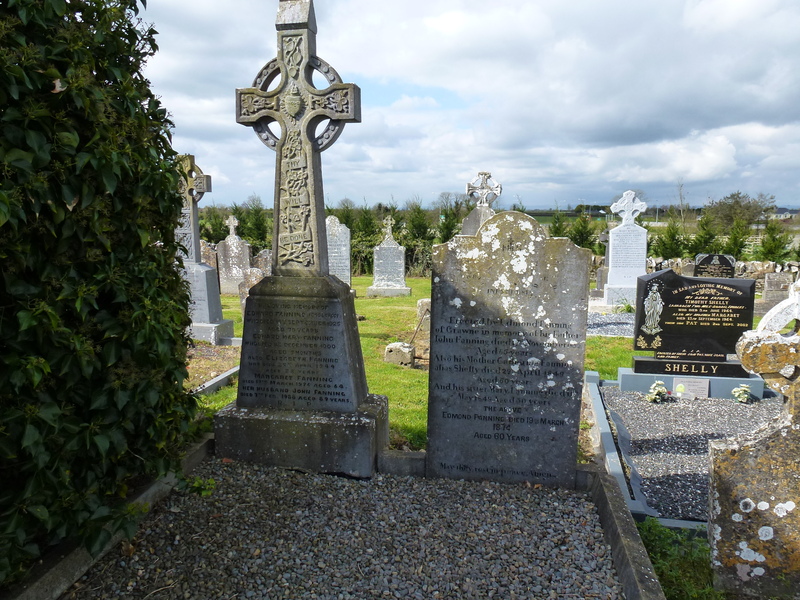 PHILIP DARMODY died in Templemore Parish on 14 Feb 1897 aged 87. He was a farmer at Ballinlonty and married. The informant was his son Patrick Darmody also of Ballinlonty. EDWARD FANNING date of death: 24/12/1867 age: 64 Parish/District: Thurles address: Pudding Lane Married Occupation: Shopkeeper Informant: EDWARD FANNING of Pudding Lane, relationship: Householder. Cause of Death: Pheumatism, 5 years, uncertified, no med. att. JUDITH FANNING date of death: 20/04/1865 age: 70 Parish/District: Tullamaine address: Ballynatten Powerstown Status: Widow Occupation: small Farmer Informant: PATRICK FANNING, address: Ballynatten cause of death: General Debility and old age. 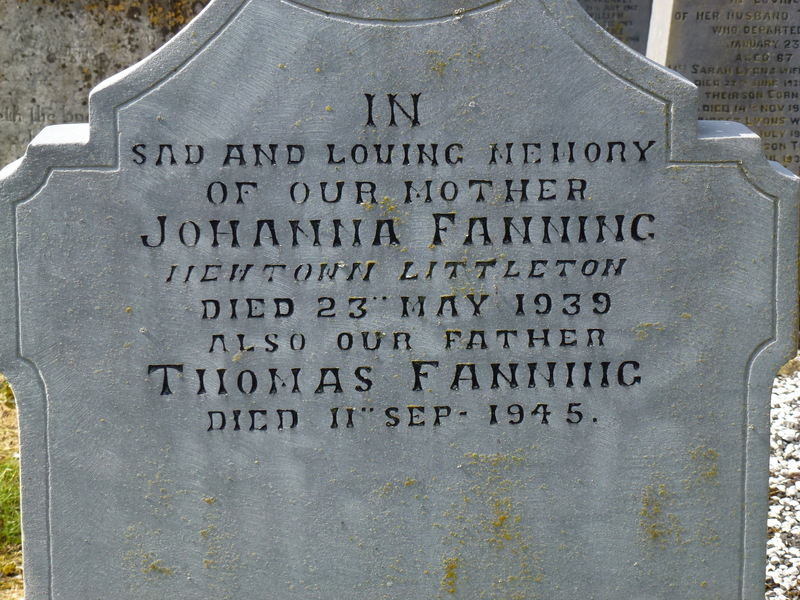 JOHANNA FANNING date of death: 18/03/1877 age 28 Parish/District: Littleton address: Castletown status: spinster (previously unmarried) Occupation: Farmer’s Daughter Informant: MICHAEL FANNING, address: Castletown, relationship: Householder. Cause of Death: Heart Disease, 5 weeks, certified. JUDY FANNING date of death: 9/12/1868 age 64, Parish/District: Thurles Address: Turtulla Status: married Occupation: Labourer Informant: THOMAS FANNING, address: Turtulla, relationship: Householder. Cause of death: Bronchitis, 5 wks, no medical attention* Address Moycarkey. JOHANNA FANNING date of death: 5/3/1890 age 47 Parish/district: Thurles, address: Turtulla. Status: Widow. Occupation: Laborer. Informant Bridget Ryan, daughter,address:Turtulla. Notes: Address Moycarkey. Cause of death: Bronchitis for 3 wks, no medical attention. JOHANNA FANNING date of death 13/03/1898 age 60 Parish/District: Thurles address: Main St, status: spinster(previously unmarried) Occupation: shopkeeper Informant: J Mcinerney, relationship: Householder Cause of death: Debility, no med. att. JOHANNA FANNING Date of death: 20/04/1879 Age: 68. Parish/District: Holycross Address: Holycross. Graveyard: Holycross Old Gr. Page 34. Notes: Erected by REV. James. J. Fanning, son and Rev P. Fogarty, nephew. She was the wife of James Fanning. MARGARET FANNING date of death : 25/09/1864 age 54 Parish/District of Thurles , address Nicholas Street, married to JOHN FANNING farmer of same address. Cause of death Typhus Fever for 8 days certified. Occupation farmer’s wife. JAMES DWYER date of death: 06/10/1888 District/Parish: Thurles. Age: 30 Address: Main St., married, Occupation: Shopkeeper. Informant: Winnie Mcgrath, householder of Quarry St . Cause of death: Phthisis for 4 mths certified. PATRICK FANNING date of death:23/05/1868 age: 8 days. Address: Turtulla. Parish of Thurles. Labourer’s son. Informant: Michael Fanning of Turtulla, householder. Cause of death: convulsions for 2 days, uncertified, no medical attention. 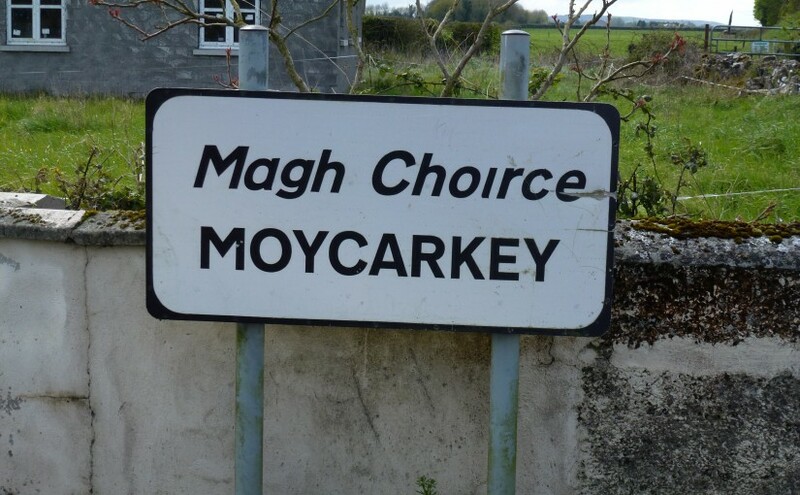 Notes:address Moycarky. THOMAS FANNING date of death: 23/05/1898 age 73. Address: New Gate. Parish of Thurles. Married and shopkeeper. Informant: Johanna Hayes, householder of New St. Cause of death: Cirrhosis of liver, 3 yrs, certified. 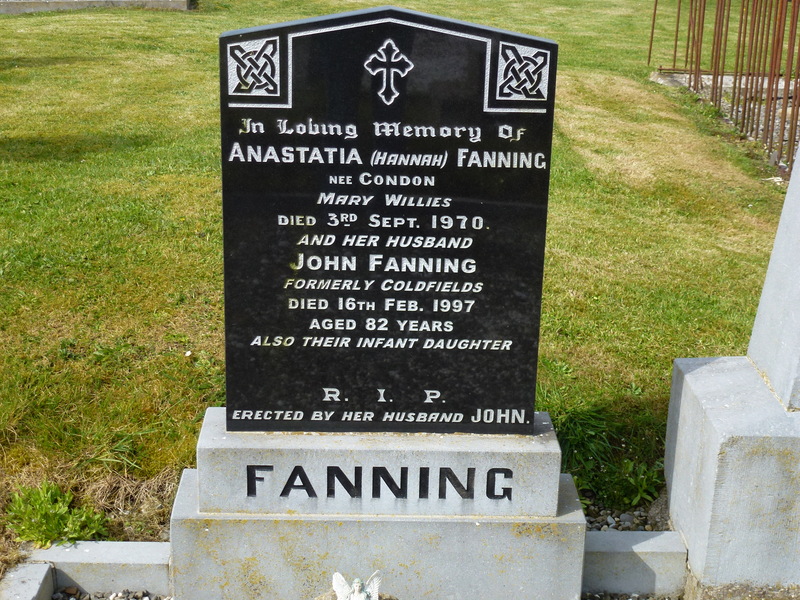 ANASTASIA FANNING, most likely the wife of the above Thomas Fanning, died 2 Feb 1910 aged 90 in Thurles Parish. She lived at New St in Thurles and was a shopkeeper and a widow. The informant was E.Callanan, householder of New St. She died from bronchitis. PATRICK FANNING date of death: 17/09/1864. Age 36. Parish of Thurles Address: Quarry St. Married labourer. Informant is wife JUDY FANNING of Quarry St. Cause of death: Measles for 11 days, certified. WILLIAM FANNING date of death 12/10/1874. Age 81. Address: Templemore. Married. Labourer. Informant: Cath Fanning, householder of Templemore. Cause of death: general Paralysis, for months, certified. 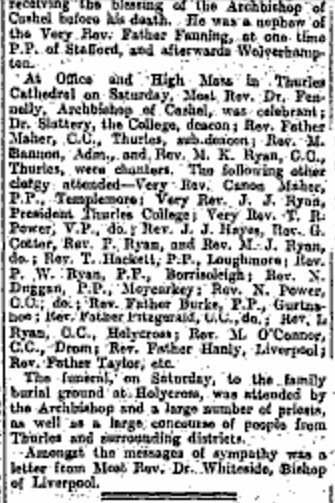 THOMAS EVASTON date of death 25 April 1888, Parish of Thurles, age 80, address Clonomacoque. Widower. Farmer. Informant was his son, Martin Eviston of Clonomacoque. This Thomas Evaston was married to MARY FANNING 1807-1846, daughter of William Fanning and Hanera Cormick. 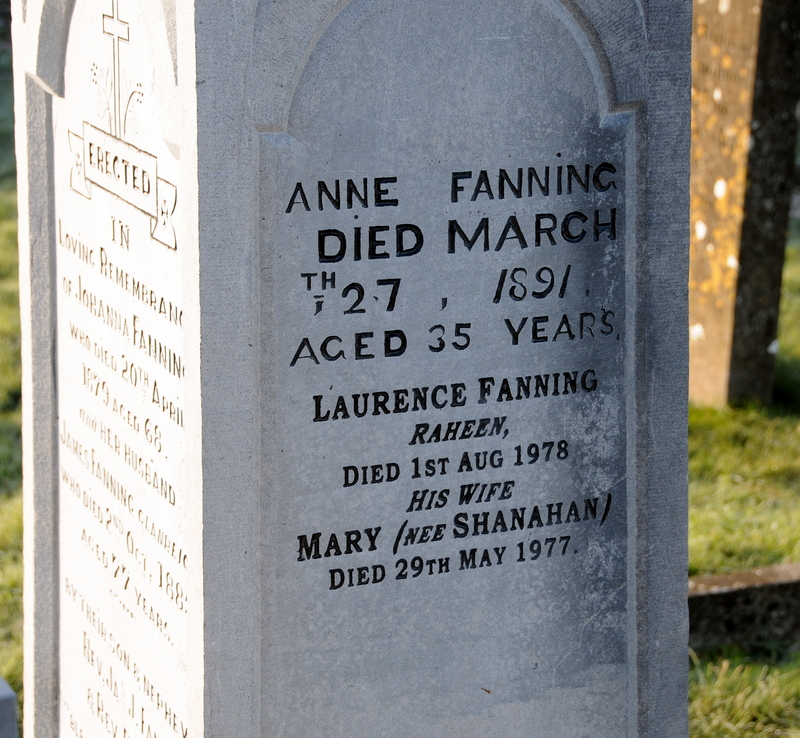 ANNE FANNING date of death 26 Nov 1876, Thurles Parish, age 76. Address: Workhouse Occupation: Laborer Widow. Informant: Householder, Edward Walsh, Workhouse. Cause of death Insanity and bronchitis. Certified. ANNE FANNING date of death: 23 April 1887, age 68, Address: Jail St., Widow, Occupation: Shopkeeper. Parish of Thurles. Informant: Mary Fanning, daughter of Jail St. Cause of death: Chronic bronchitis, 4 mths, no medical attention. 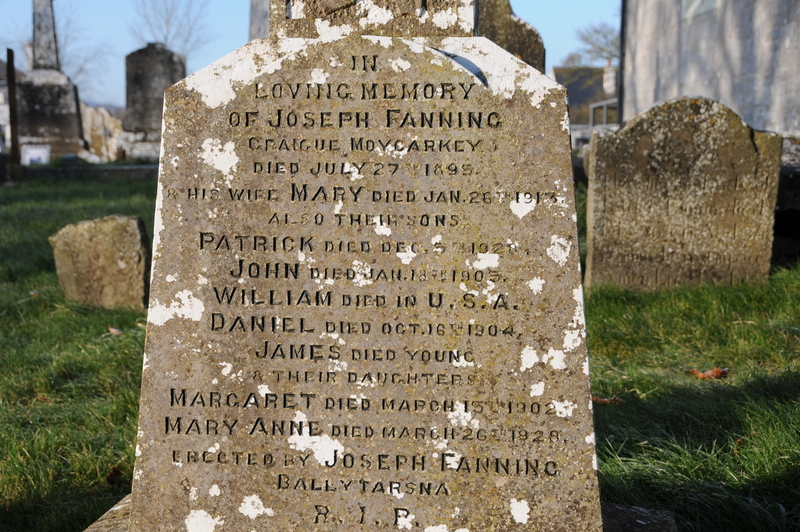 JOSEPH FANNING date of death 16/07/1848 Age 67 Parish/District : Holycross. Buried in Holycross Church of Ireland grave. Erected by son Ml of America (Michael) Page 8. JOSEPH FANNING date of death 27/07/1895, age not recorded. Parish of Holycross. Address: Graigue Moycarkey. Graveyard: Holycross Church of Ireland Page 8. 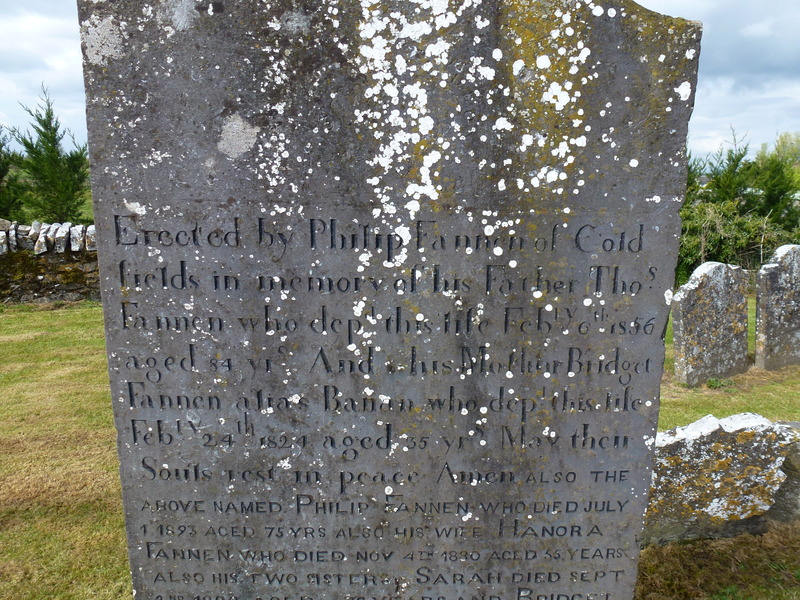 Notes: Husband of Mary, father of Patrick, John, William, Daniel, Margaret and Mary Anne. Erected by Joseph Fanning of Ballytarsna. 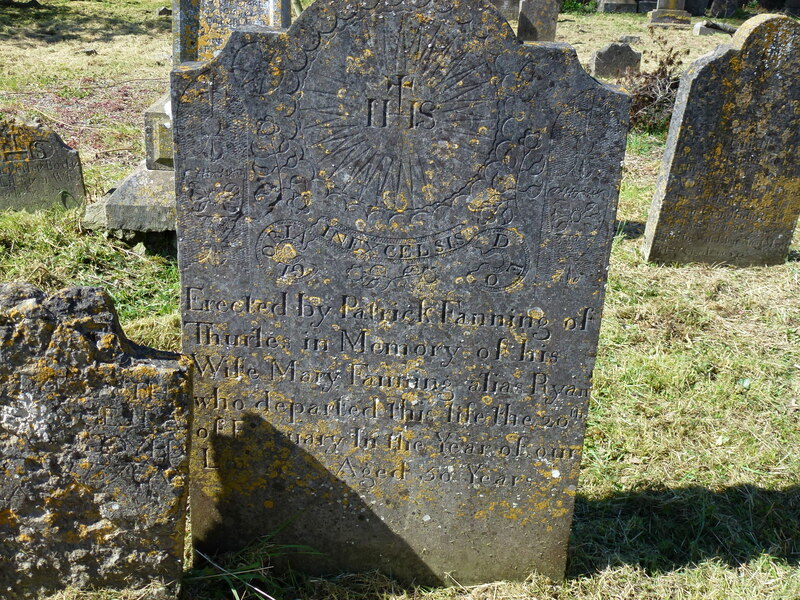 JOSEPH FANNIN died 24/12/1795, aged 67, address Holycross, in the Parish/District of Holycross, occupation not recorded. Buried in Holycross Old Gr. Page 34. 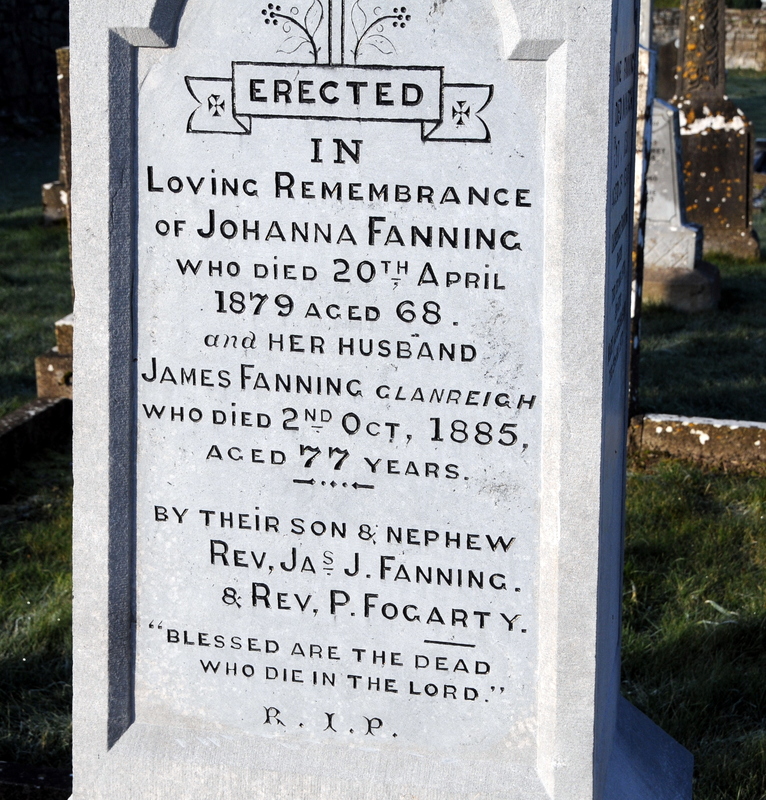 JAMES FANNING died 02/10/1885, age 77, in the parish/district of Holycross. Address: Glenreigh. Graveyard: Holycross Old Gr. Page 34. Notes: Erected by Rev Jas J Fanning his son and Rev P. Fogarty his nephew. Husband of Johanna Fanning. 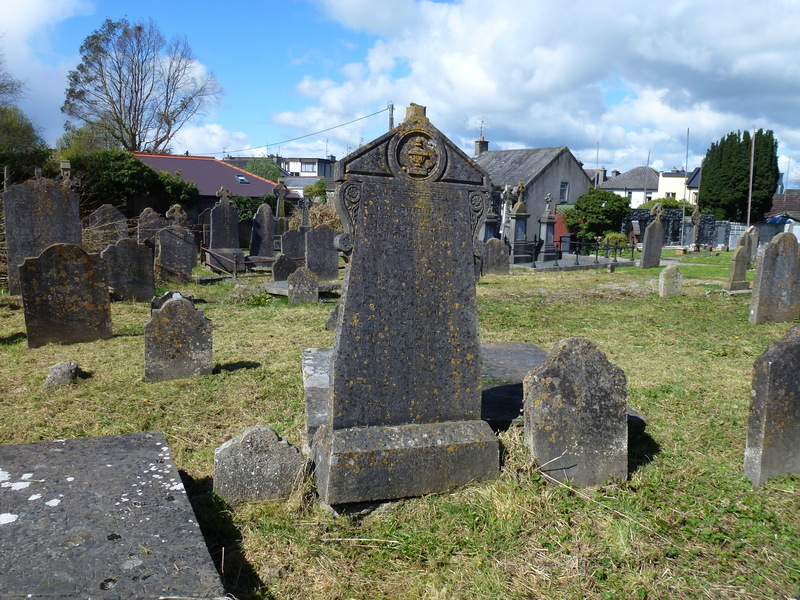 BRIDGET FANNEN died 24/02/1824, aged 35, in the parish/district of Two-Mile-Borris. Address: Coldfields. Graveyard: Two’M’Borris Old & New. Page 10. Notes: Alias Banan. Erected by Philip Fannen, her son. Wife of Thos. Fannen and mother of Sarah & Bridget Fannen. Old Cemetery. 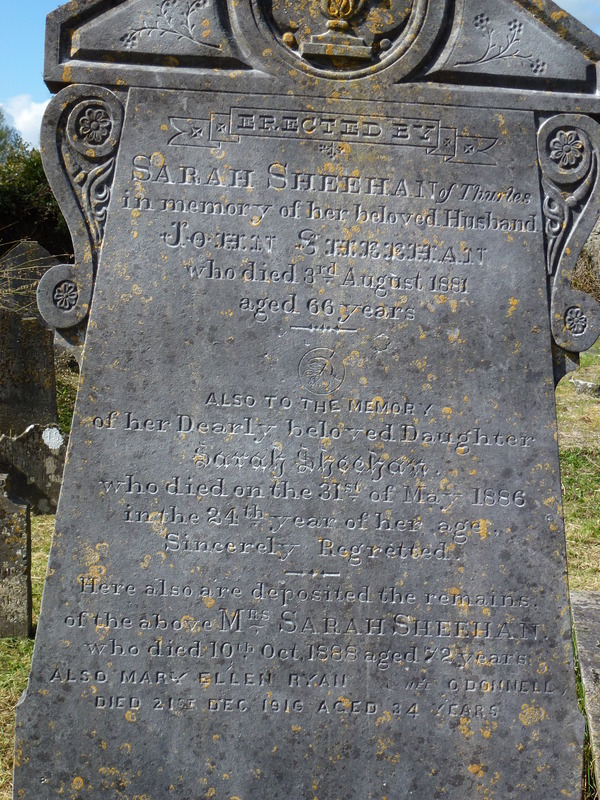 CATHERINE FANNING nee SHELLY died 29/04/1849 age 60 in the parish/district of Two-Mile-Borris. Address: Grawne. Graveyard: Two’M’Borris Old & New Page 10. Notes: (Old Cemetery) Alias Shelly. Erected by her son Edmund Fanning. Wife of John Fanning and mother of Mary Fanning. 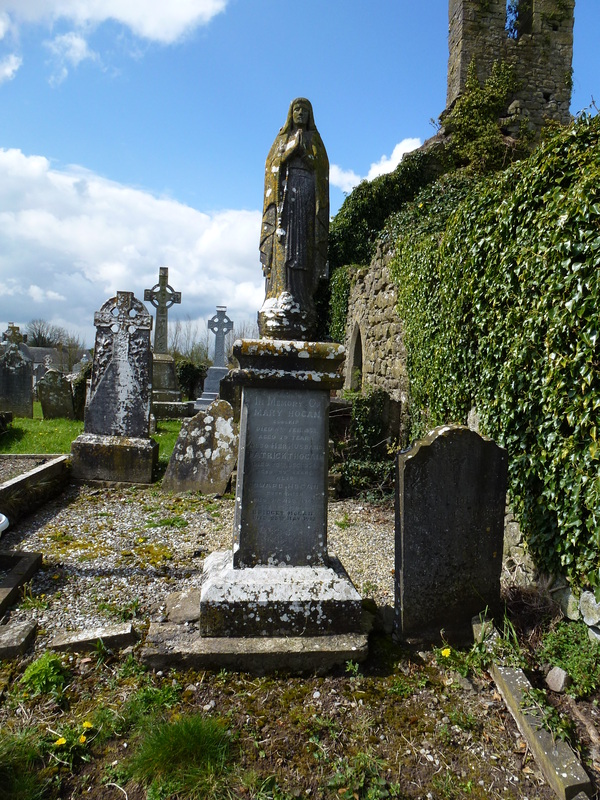 MARY FANNING died 11/05/1849 aged 30, address : Grawne in the Parish/District of Two-Mile-Borris . Graveyard: Two’M’BorrisOld & New. Page 10. Notes: Old Cemetery. Erected by Edmund Fanning her brother. Daughter of John and Catherine Fanning. EDMUND FANNING died 19/03/1874 aged 60. Parish/District: Two-Mile-Borris. Address: Grawne. Graveyard: Two’M’Borris Old & New. Page 10.Notes: (Old Cemetery) Erected by Edmund Fanning- The above son of John & Catherine Fanning. Brother of Mary Fanning. The death record for the above Edmund Fanning has the parish as Littleton, his address as Grawn, he was married and a farmer. His name was entered as Edmond. The informant was a Mary Dwyer, householder also of Grawn. The cause of death was 6 months debility with no medical attention. JOSEPH FANNING date of death: 21/08/1879. Age Not recorded. Parish of Holycross Address: Horse & Jockey. Graveyard: Holycross C of Ireland Grave. page 8. Notes: Erected by his loving daughters. JOHN FANNING date of death : 19/11/1852. age 65. 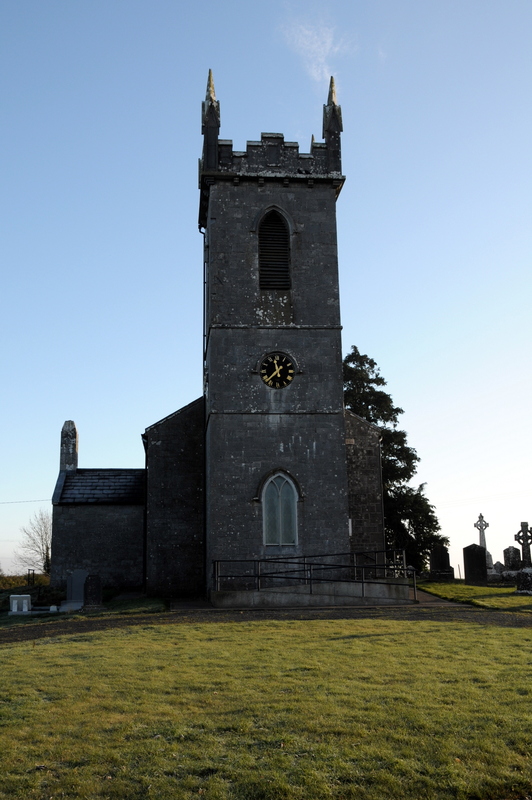 Parish of Two-Mile-Borris. Address: Grawne. Graveyard: Two’M’Borris Old and New. page 10. Notes: (Old Cemetery) Erected by son Edmund Fanning. Husband of Catherine Fanning, father of Mary Fanning. JOHANNA FANNING, 23 May 1939, Newtown, Littleton. Parish/district of Moycarkey. Wife of Thomas Fanning. Moycarky Old graveyard. 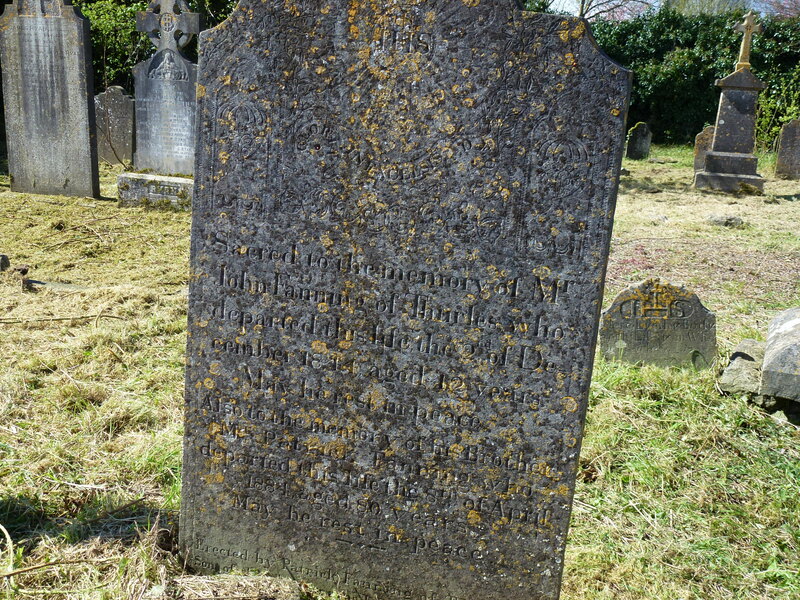 MARY FANNING date of death:9/4/1804, age: 32 Parish/District: Ballycahill Graveyard: Ballycahill. Notes: Daughter of Thomas Fanning. (Book 18). 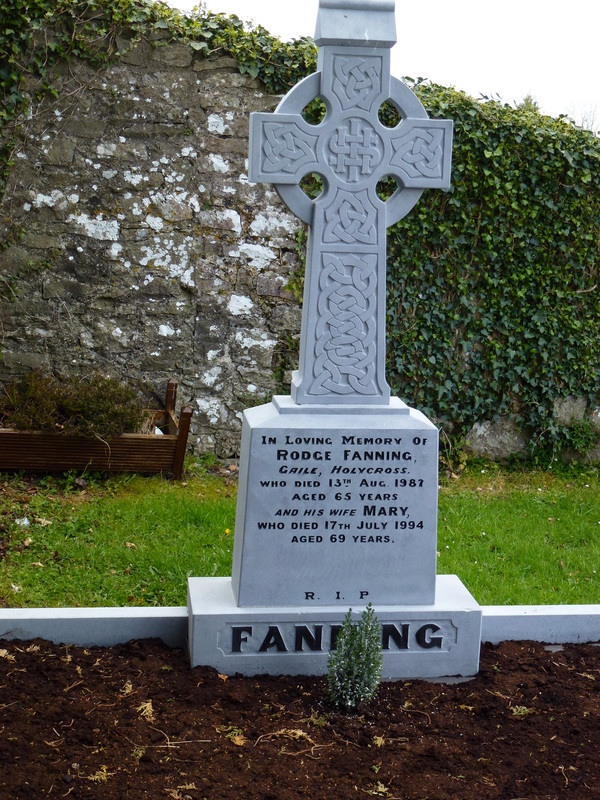 THOMAS FANNING date of death: 28/03/1837, age : 81, Parish/District: Ballycahill Graveyard:Ballycahill. Notes: Erected by Edmond Fanning his son. Son of Mary Fanning (Book 18). 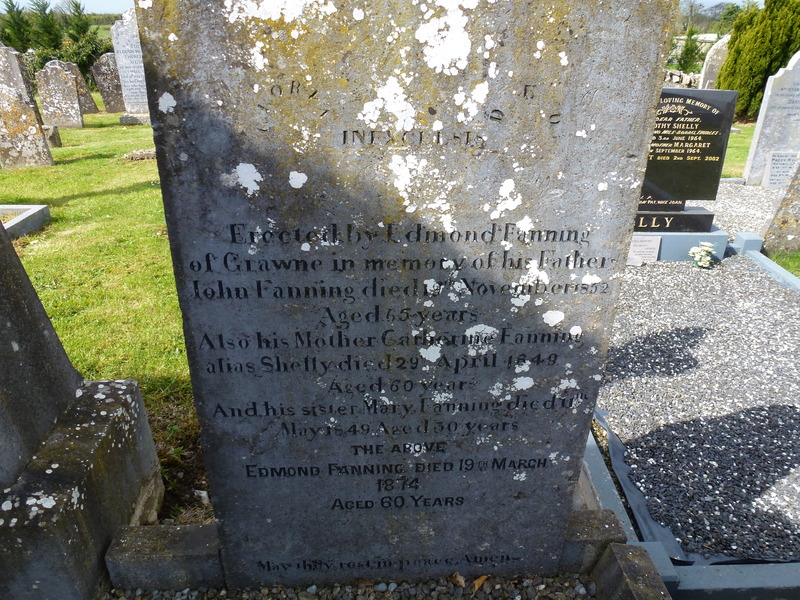 EDMOND FANNING date of death: 15/07/1805, age: 76, Parish/District: Ballycahill Graveyard: Ballycahill. Notes: Father of Mary Fanning. (Book 18). FANNING First name not recorded or any other details. Buried in Ballycahill. Erected by Mary Fanning. Rest of stone sunken. (Book 18). Plot No: Page 13. 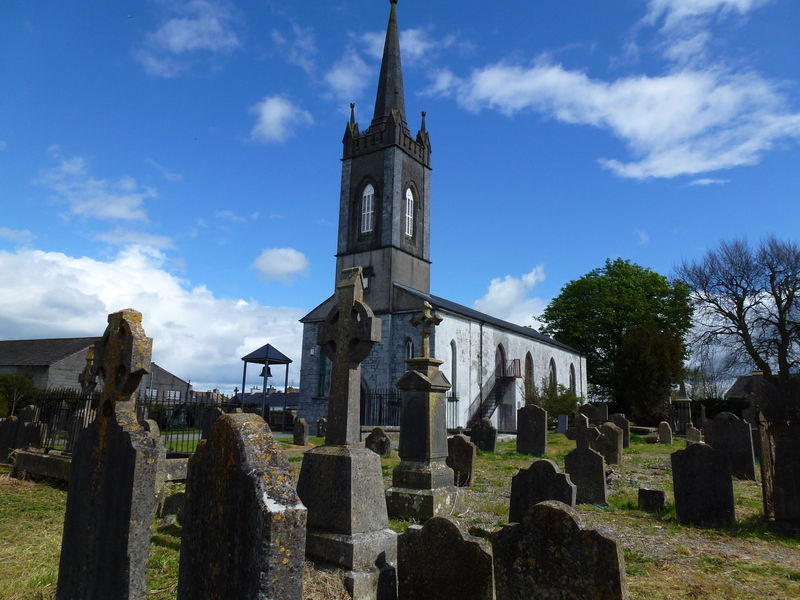 The list of Fanning burials in Loughmore and Templeree Cemeteries is from the book “Loughmore Parish Index to Burials in Loughmore and Templeree Graveyards” which can be found in the Thurles Library. At the back of the book is a map of all the grave locations. The map is on A3 paper so too big to be usefully put here. If you want to know the position of a particular Fanning, Eviston or Moloney grave that is on the lists I have uploaded to this site from this book, contact me and I may be able to help you. Rev John Fanning was born in Loughmore 10 Nov 1805. He was ordained on the 14th March 1840. He served in England at Taunton, Tiverton, Chipping, Wolverhampton, Hanley, Bromsgrove, Stafford, Clifton and Frome. He retired in 1884 and stayed with his nephew Rev James J Fanning in Liverpool. He returned to Ireland in 1888 and died in Holycross on 13 August 1891. This information came from St Thomas Priory, kindly sent to me by Mark Ryan. From his death record he died in Glenreigh and the informant is another nephew Edmund Fanning of Glenreigh. 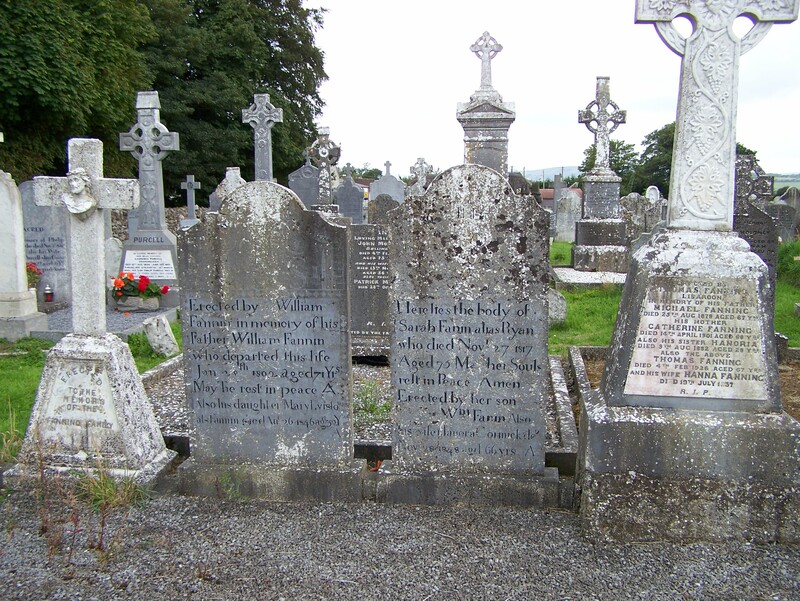 John’s brother James died 2 Oct 1885 aged 77 in Holycross, his address was also Glenreigh. His gravestone in Holycross Old Graveyard was erected by his son Rev James Fanning and his nephew Rev P Fogarty. James was the husband of Johanna. 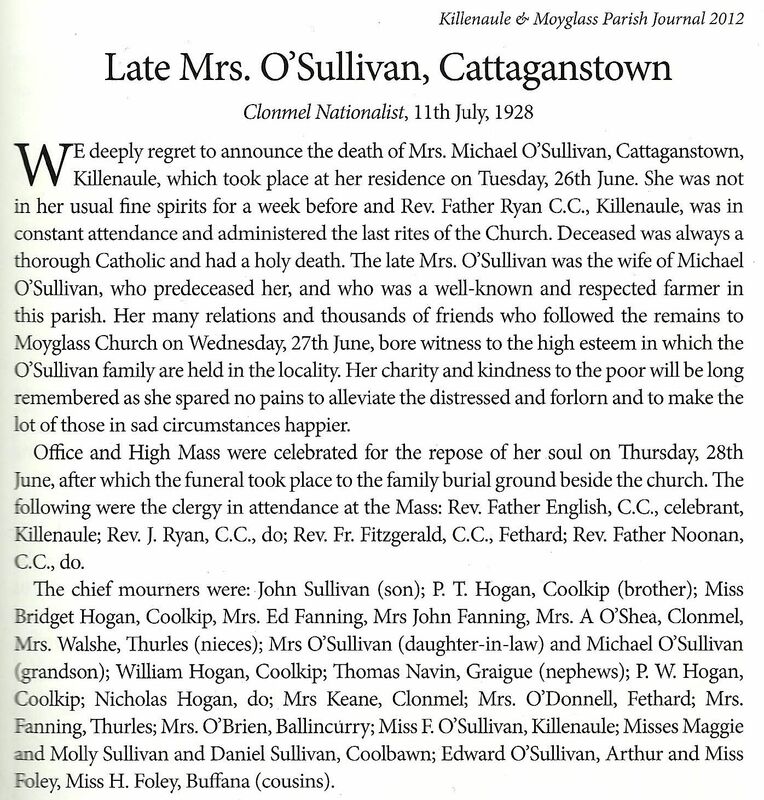 JOHANNA FANNING date of death: 11/11/1111 Age: not recorded Parish/District: Loughmore West, Address: Gurtnaha. Graveyard: Loughmore GR RCPlot No: Page 11. Notes: Erected by Timothy Fanning, her brother. Daughter of John and Honora Fanning. E * Johanna Allice Bridget Fanning ( name of deceased was entered as Johanna Allice Bridget Fanning). PATRICK FANNING date of death :27/03/1840, age: 89, Parish/District : Loughmore West, Address: Gurtnaha. 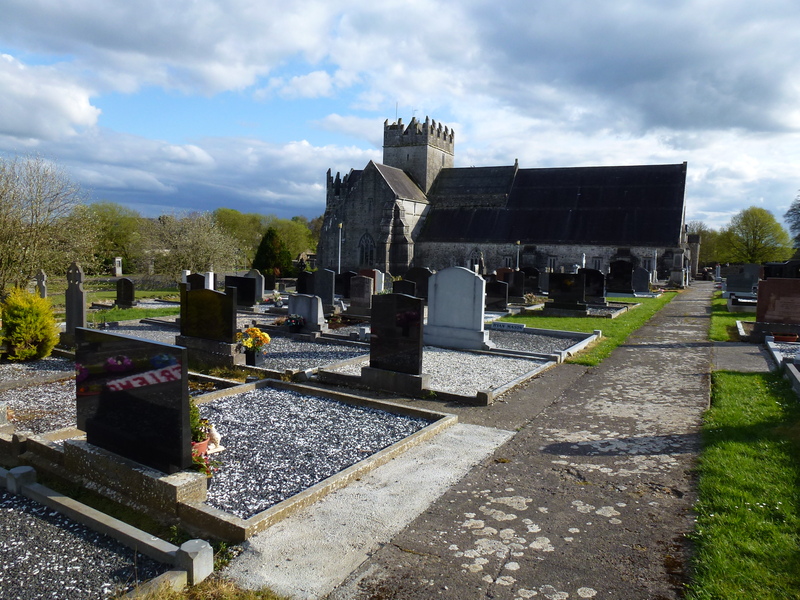 Graveyard: Loughmore Gr RC Plot No: Page 11.Notes: E* PATK. (Upright) Erected by Thomas Fanning- his son. HONORA FANNING date not recorded or legible, address Gurtnaha, Parish/District of Loughmore West. Erected by Timothy Fanning. Daughter of John and Honora Fanning. 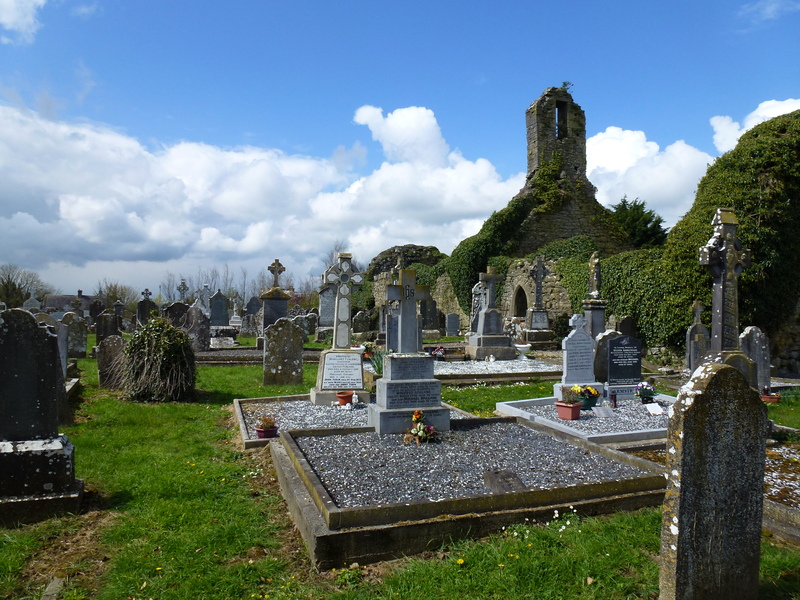 Graveyard:Loughmore Gr. RC . Page 11. HONORA FANNING date not recorded or legible, address Gurtnaha, Parish/District of Loughmore West. Erected by Timothy Fanning her son. Wife of John Fanning.Mother of Patrick, William, Johanna Allice Bridget, Honora Fanning and Mrs Ellen Leamey. 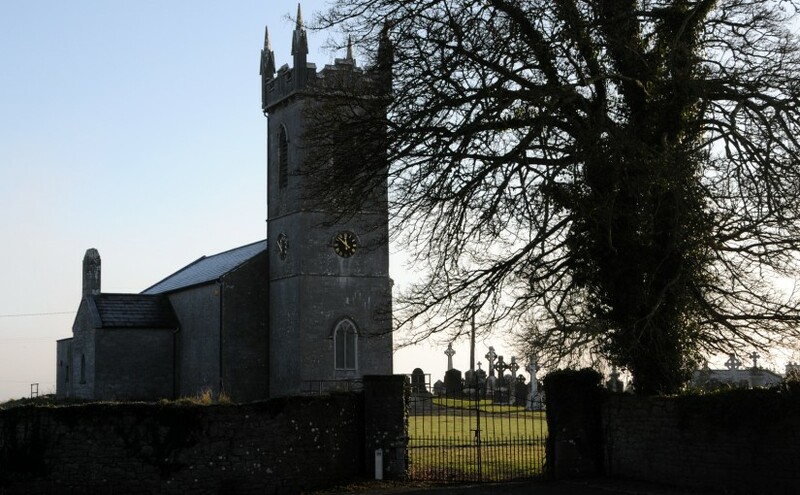 Graveyard: Loughmore Gr.RC. Page 11. JOHN FANNING no date address: Gurtnaha, parish/district of Loughmore West, Graveyard: Loughmore Gr RC page 11. Erected by Timothy Fanning his son. Husband of Honora Fanning and father of Patrick, William, Johanna Allice Bridget, Honora Fanning and Mrs Ellen Leamey. 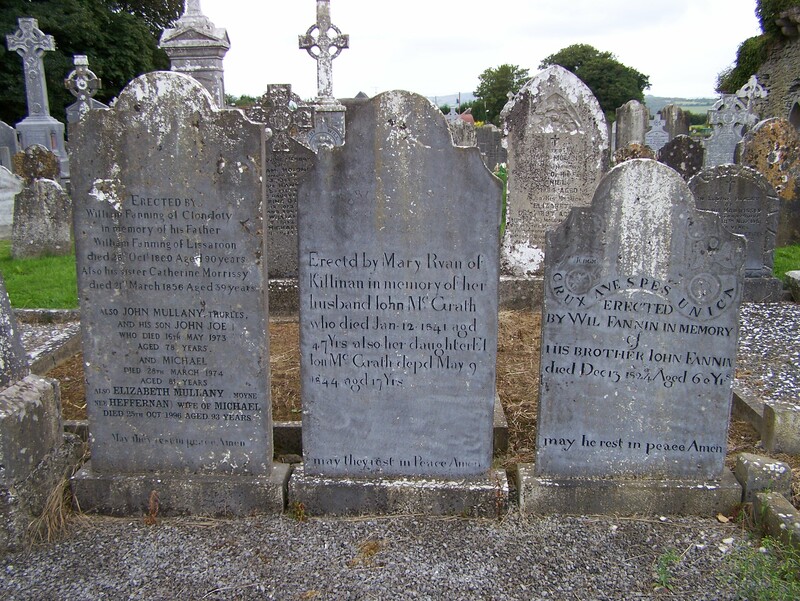 MARY FANNING died 12 Dec 1884, age 74, Cassestown, farmer,spinster. Informant: Margaret Burke, Racecourse. Parish/district of Thurles. Civil death record. 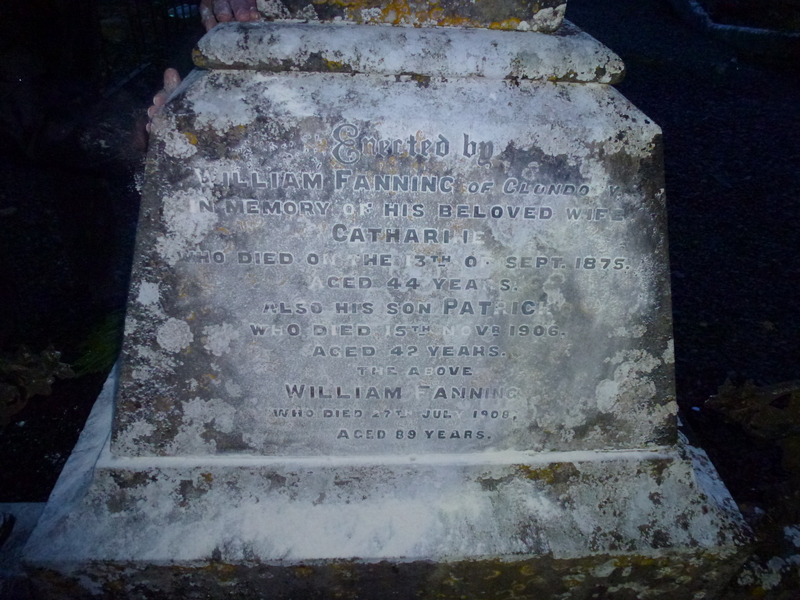 WILLIAM FANNING no death date,age not recorded,Parish/district of Loughmore West, address : Gurtnaha. 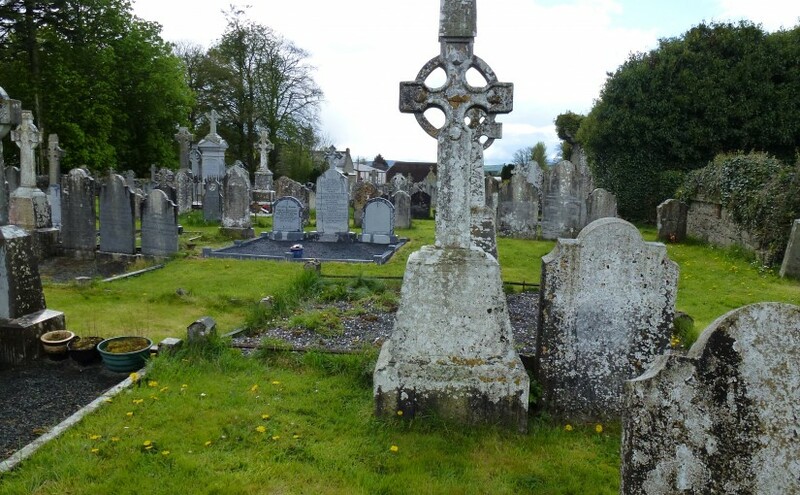 Graveyard: Loughmore Gr RC. Page 11. Notes: Erected by his brother Timothy. Son of John and Honoria Fanning. PATRICK FANNING no death date or age. Parish/district of Loughmore West. Address: Gurtnaha. 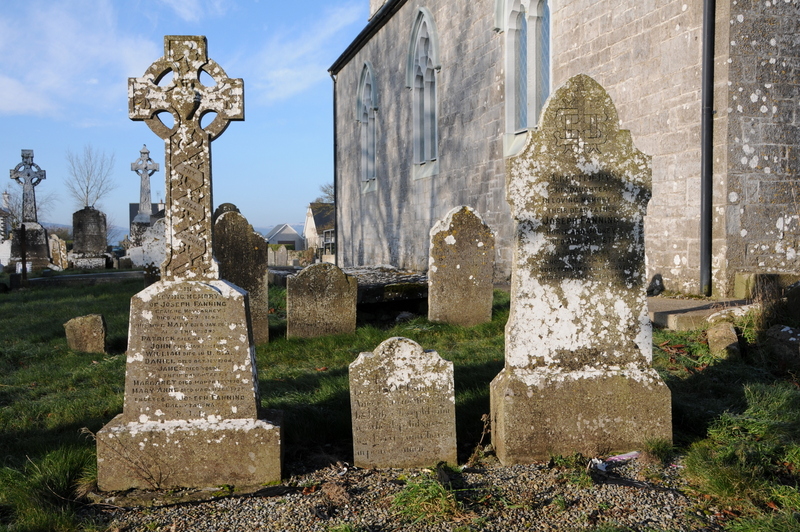 Graveyard : Loughmore Gr RC. Page 11. Notes: Erected by his brother Timothy. Son of John and Honoria Fanning. 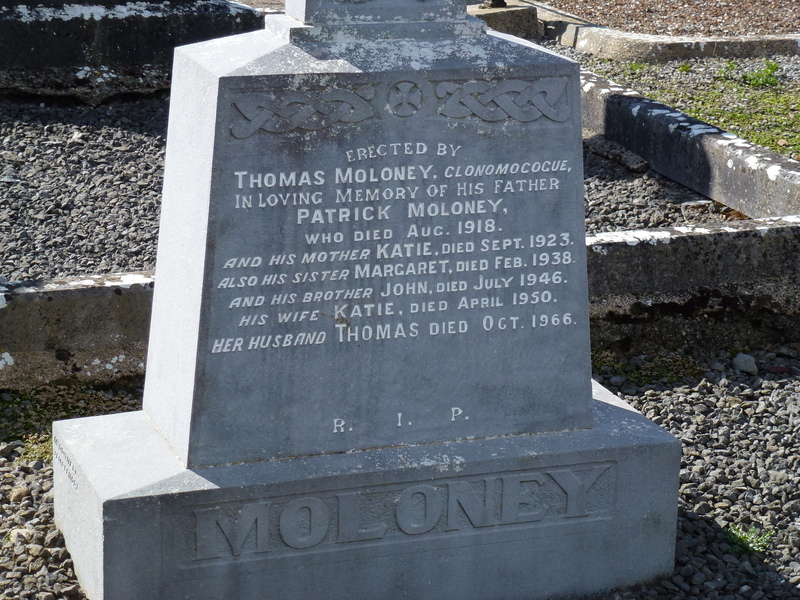 Hanora Fanning 1873-1970 married Patrick Moloney of Clonomacogue. 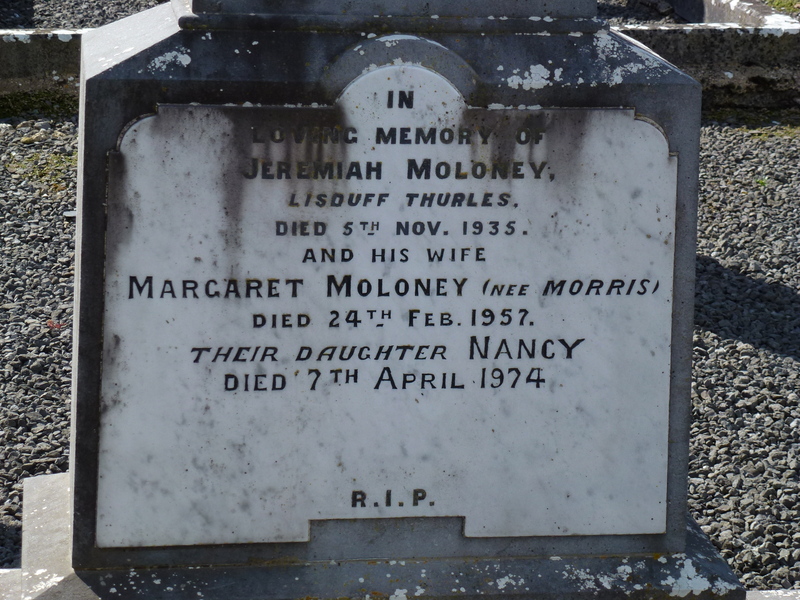 Below are some of the Moloney gravestones in Loughmore Cemetery. 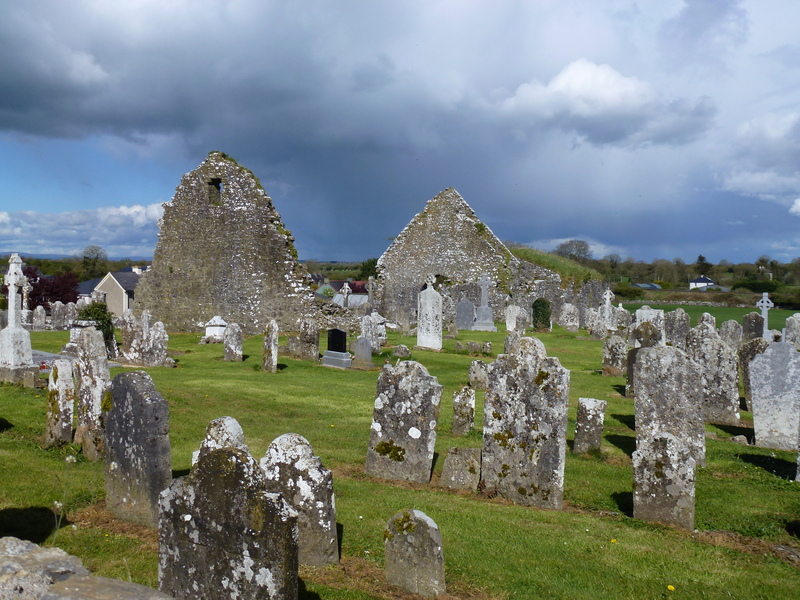 From “Loughmore Parish Index to Burials in Loughmore and Templeree Graveyards” held at the Thurles Library Co Tipperary Ireland. There is a map of the location of the graves and if you contact me I may be able to help you locate specific Moloney graves in these cemeteries. 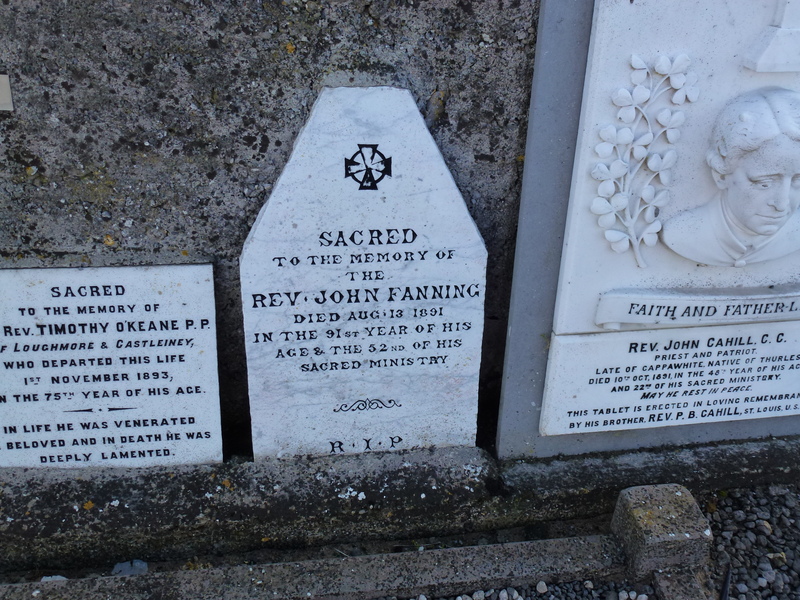 JOHN FANNING of Kilvilcoris died 20/08/1876 aged 90. Parish of Drom. Buried in the Drom RC Ch Graveyard. Page 8. Husband of Margaret Fanning alias Russell. 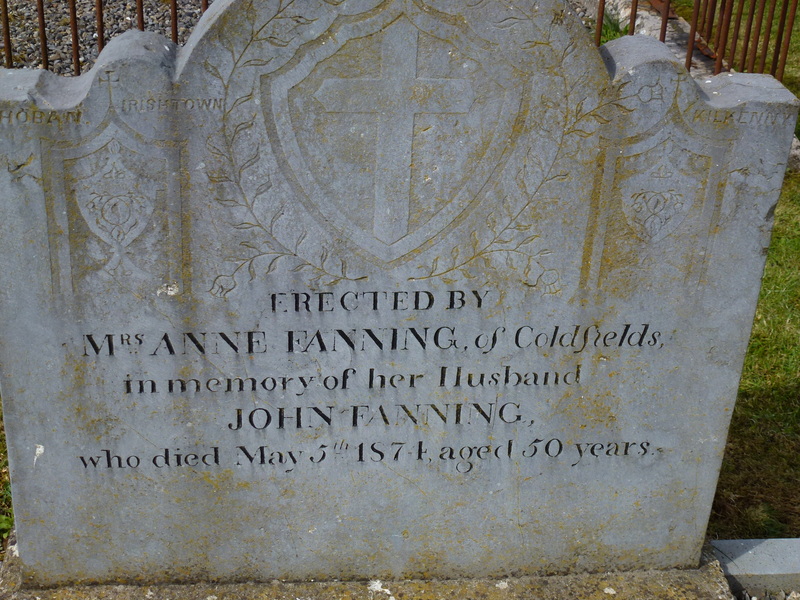 MARY FANNING date of death : 28/03/1855 Age: 90 Parish/District: Thurles Graveyard: Relic Breda Thur.CP Page 3. MARY FANNING date of death : 02/12/1855 Age: 90 Parish/District: Ballycahill Graveyard: Ballycahill Page 13. Erected by her son Edmond Fanning. Wife of Thomas Fanning. MARY BURKE alias FANNING date of death : 11 Nov 1111 Parish/District: Ballycahill Graveyard: Ballycahill Page 6. Erected by her son Thomas Burke. JOSEPH FANNING died 29 July 1927, Main St Templemore. JOHN FANNING Int 31 Oct 1937, age 6, Main St Templemore. MARGARET FANNING died age 47, int 27 Feb 1958 Address McDonagh terrace, Templemore. 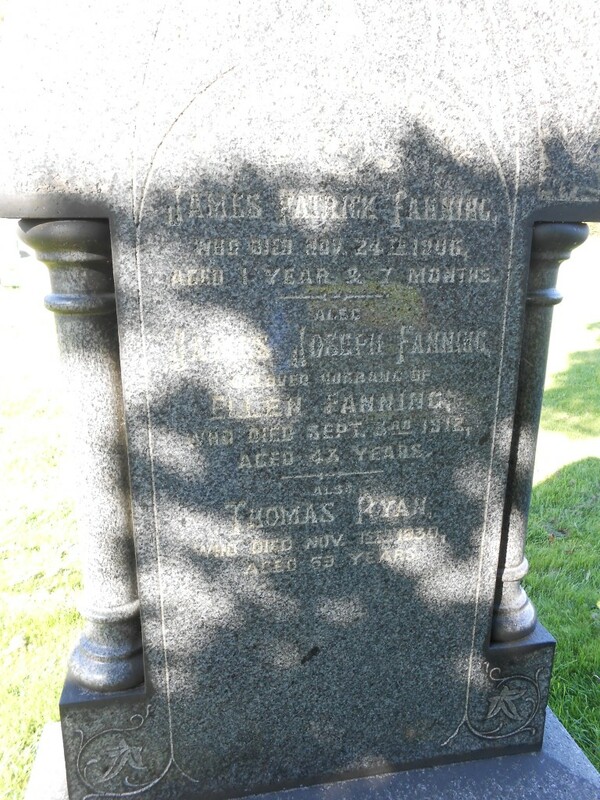 JOSEPH FANNING died in infancy, 22 Jul 1924, son of Anne & Edward Fanning, Main St Templemore. Buried in Templemore RC Graveyard. Plot 74. 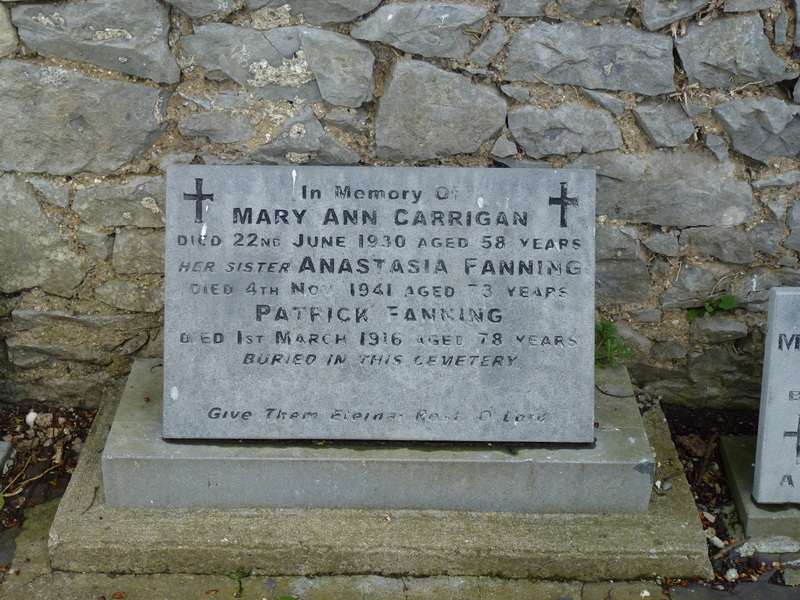 MARY FANNING died age 6, 19 Apr 1930, daughter of Anne & Edward Fanning, Main St Templemore. Buried in Templemore RC Graveyard. Plot 74. 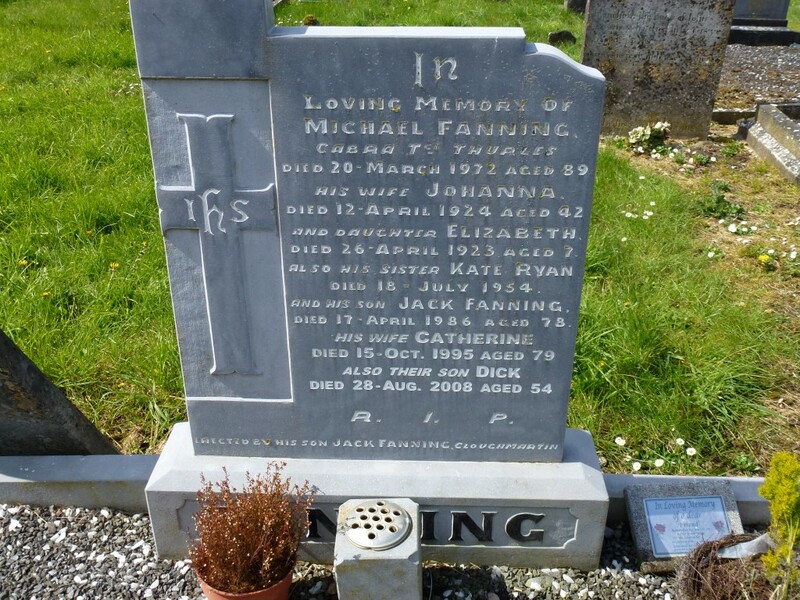 SEAN FANNING died Age 5, 30 Oct 1937, son of Anne & Edward Fanning, Main St Templemore. Buried in Templemore RC Graveyard. Plot 74. 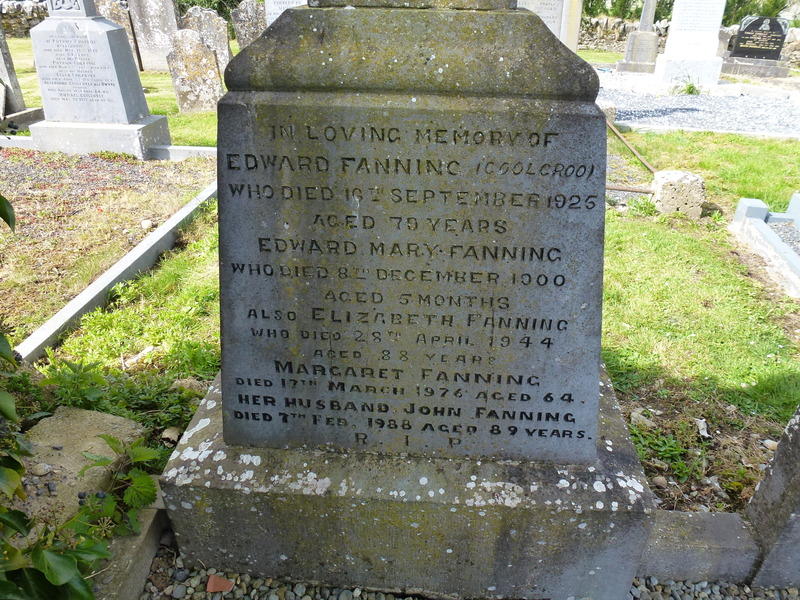 EDWARD FANNING died age 72, 5 May 1949, Main St Templemore. Husband of Anne & father of Joseph, Mary and Sean Fanning. Buried in Templemore RC Graveyard. Plot 74. 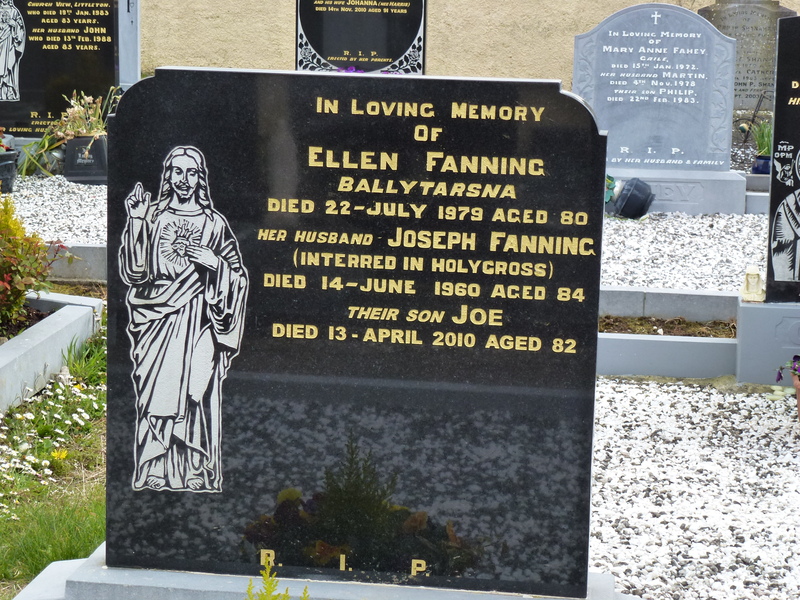 ANN FANNING died age 93, 24 April 1986, Wife of Edward Fanning of Main St Templemore and mother of of Joseph, Mary and Sean Fanning. Her address 4 Trees Avenue, Mount Merrion, Dublin. Buried in Templemore RC Graveyard. Plot 74. THOMAS FANNING died 20 Jul 1981, age 75, brother of Michael & Nicholas Fanning, Address The Abbey. Buried in Templemore RC Graveyard. Plot 2. MICHAEL FANNING died 10 Oct 1985, age 79, Mary St Templemore, brother of Thomas & Nicholas Fanning The Abbey. Buried in Templemore RC Graveyard. Plot 2. 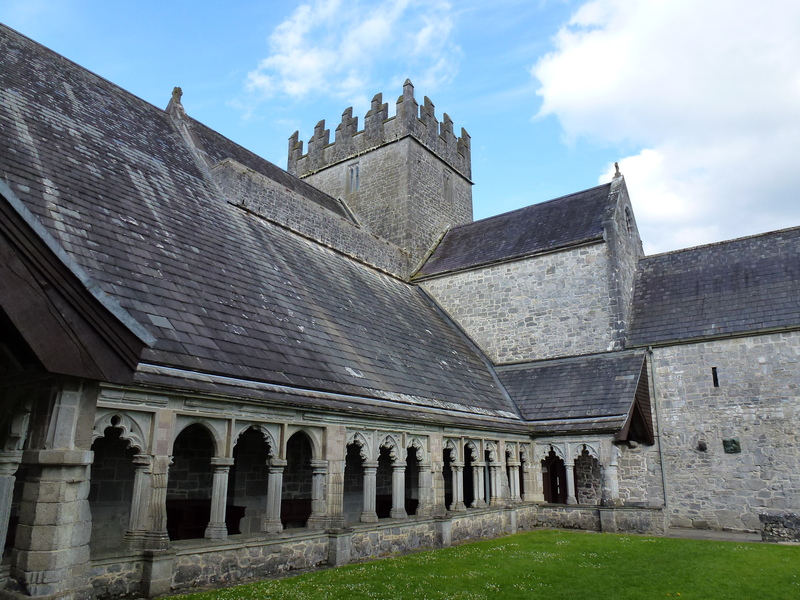 NICHOLAS FANNING died 24 June 1993, age 85, brother of Thomas & Michael Fanning The Abbey. Buried in Templemore RC Graveyard. Plot 2. 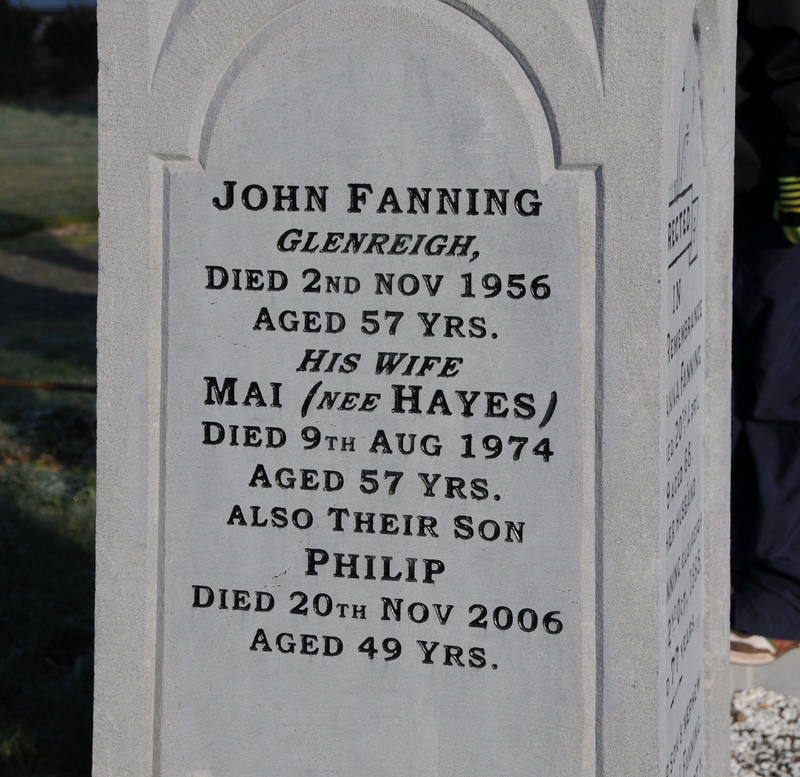 JOHN FANNING died 7 Nov 1953 in Glenkeen Parish/District and is buried in Borrisoleigh New Graveyard. 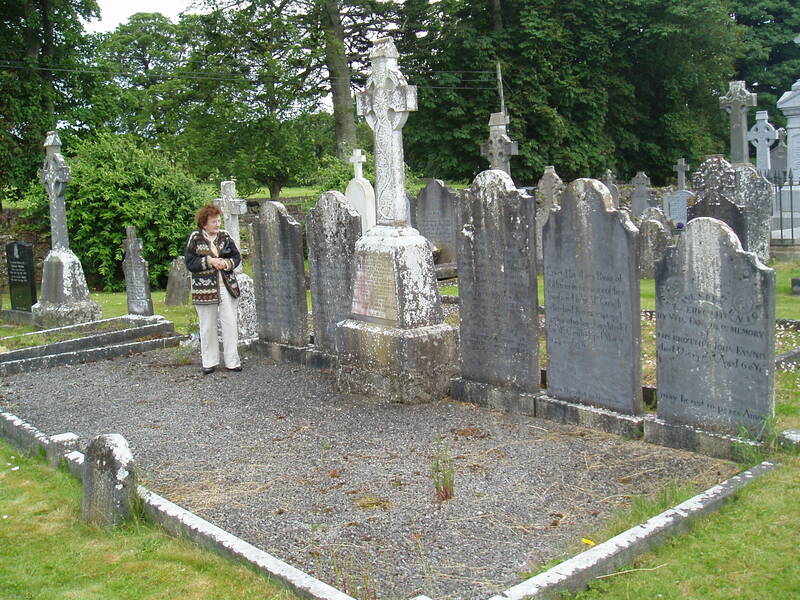 The Source of the above gravestone inscriptions is the North Tipperary Genealogy Centre. Anastasia Carrigan of Ballymurreen Thurles and Patrick Fanning of Thurles married in Dublin on 28 Nov 1895. His parents were Patrick and Mary Fanning and her parents were James and Joanna Carrigan. Her sister Mary Ann was a witness as was Hugh Ryan. This record is available through irishgeneaology.ie In the 1901 Census Patrick and Anastasia lived at 14 Main St Thurles and he was listed as a flour merchant. In 1911 they were living at 15 Main St and he was a shopkeeper. No children. 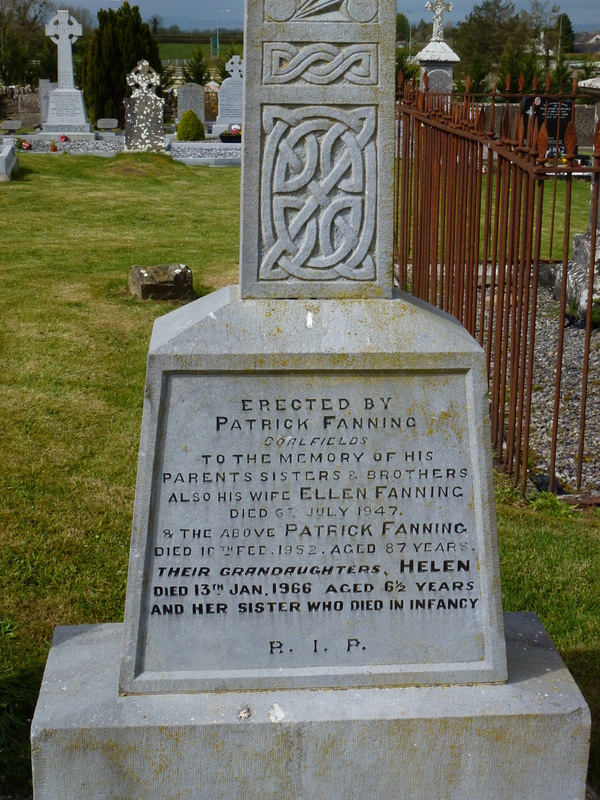 Patrick Fanning who died 1884 may be his father. See below. PATRICK FANNING date of death: 08/04/1884, age 80. Parish/District of Thurles. Address: Main St., widower, occupation: shopkeeper. Informant: Honoria Birmingham, householder of New Road. Cause of death: Chronic cystitis for 2 yrs certified. FANNING Erected by PATRICK FANNING in memory of his wife MARY FANNING alias RYAN who departed this life the 20th February in the year of Our Lord 1828 aged 50 years. Grave of Sarah Sheehan nee Fanning and her husband John. FANNIN here lies the body of RICHARD FANNIN died Dec 20th 1799 aged ___ also his wife Catherine Shanahan dept March 1st 1783(5) aged 67 years. LDS has an entry for Richard Fannin birth about 1721 in Thurles married to Catherine Shanahan about 1746 in Thurles. FANNIN Here lies the body of THOS FANNIN who depd March 10th 1820 aged 36 years May he rest in peace Amen Erected by his wife HONORA FANNIN ALS RYAN Grange Also are deposited the remains of the above HONORA RYAN who died June 20th 1871 aged 80 years and their daughter MARY FANNIN died July 16th 1827 aged 8 years. 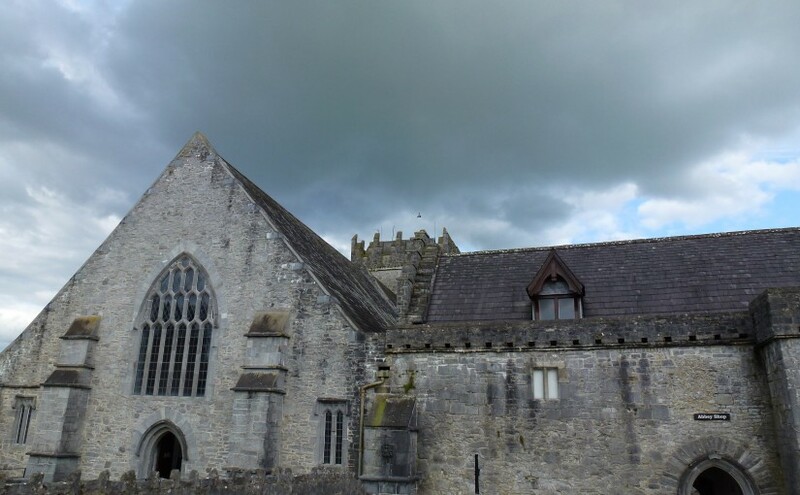 LDS site has marriage of Thomas Fannin and Honora Ryan at c 1812 in Thurles and the birth of a daughter, Mary Fannin, c 1819, Thurles and her death 16 July 1827. The gravestone inscription record from North Tipperary Genealogy Centre for the above Mary Fannin, age 8, lists her address as Grange and that she was the daughter of Thomas Fannin and Honora Fannin alias Ryan. Her mother had the stone erected. The above gravestone inscriptions from St Marys Protestant Churchyard Thurles are taken from a list by Jim Ryan. The complete list is at Jim Ryan IGP Archives. FANNING Erected by JOHN FANNING of Thurles in memory of his wife MARGARET FANNING alias FITZPATRICK who died September 25th 1864 aged 52 years. Buried in Killinan Graveyard. The above gravestone inscription is from Killinan Graveyard Thurles and transcribed by Jim Ryan. 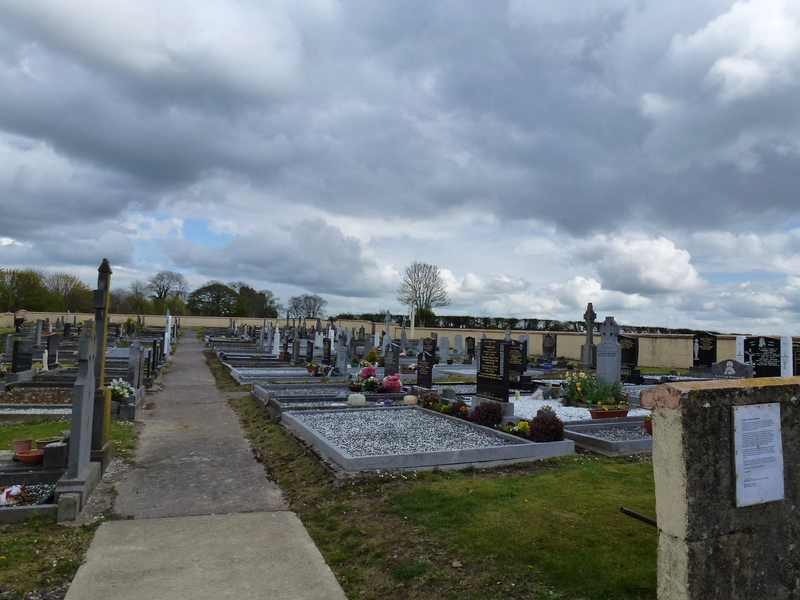 The complete list is at The Gravestone Inscriptions of Killinan Cemetery Thurles Co Tipperary. Also his daughter MARY EVISLO (EVISTON) als FANNIN died Aug 26 1846 agd 39 Y. 1848 agd 66 yrs A.
Erected by MARY RYAN of Killinan in memory of her husband JOHN MCGRATH who died Jan 12 1841 agd 47 Yrs also her daughter ELLON MCGRATH depd May 9 1844 agd 17 Yrs may they rest in Peace Amen. No one seems to know who Mary Ryan and her husband were. It is thought they may have worked for the Fannings. Erected by WILLIAM FANNING of Clondoly (Clondoty) in memory of his Father WILLIAM FANNING of Lissaroon died 28th Oct 1860 Aged 90 years.Also his sister CATHERINE MORRISSY died 21st March 1856 Aged 39 years.also JOHN MULLANY, Thurles, and his son JOHN JOE who died 16th May 1973 Aged 78 years and MICHAEL Died 28th March 1974 Aged 81 years Also ELIZABETH MULLANY, Moyne (nee Heffernan) wife of Michael Died 25th Oct 1996 Aged 93 years. 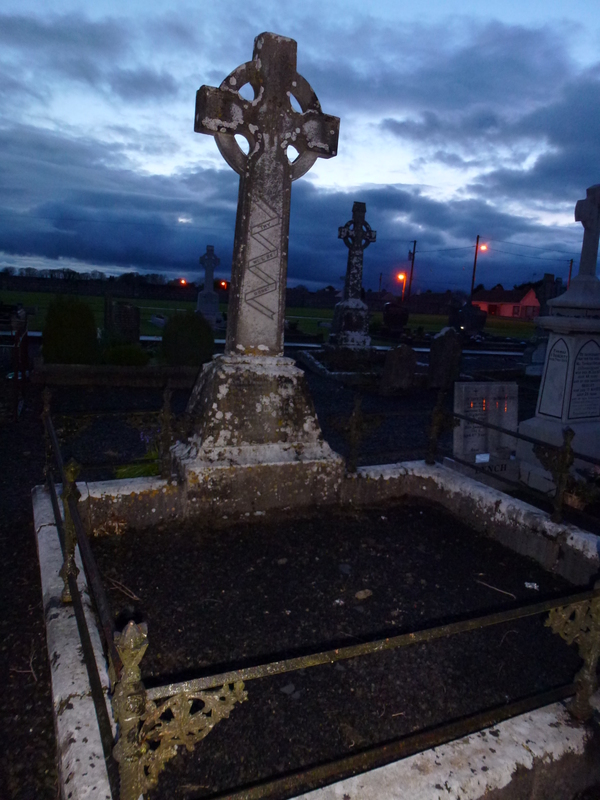 Erected by THOMAS FANNING Lisaroon in memory of his father MICHAEL FANNING died 25th Aug. 1878 aged 67 Yrs. His Mother CATHERINE FANNING died 14th April 1901 aged 68 yrs. 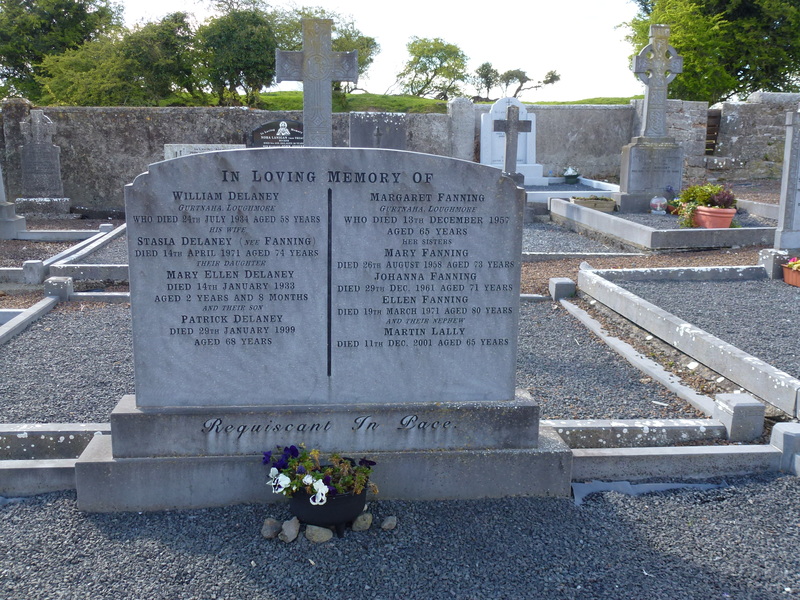 DROM – OLD CEMETERY: JOHN FANNING of Borrisoleigh died November 1936 also his wife ANNIE NEE RYAN died January 1934. Erected by son Patrick. 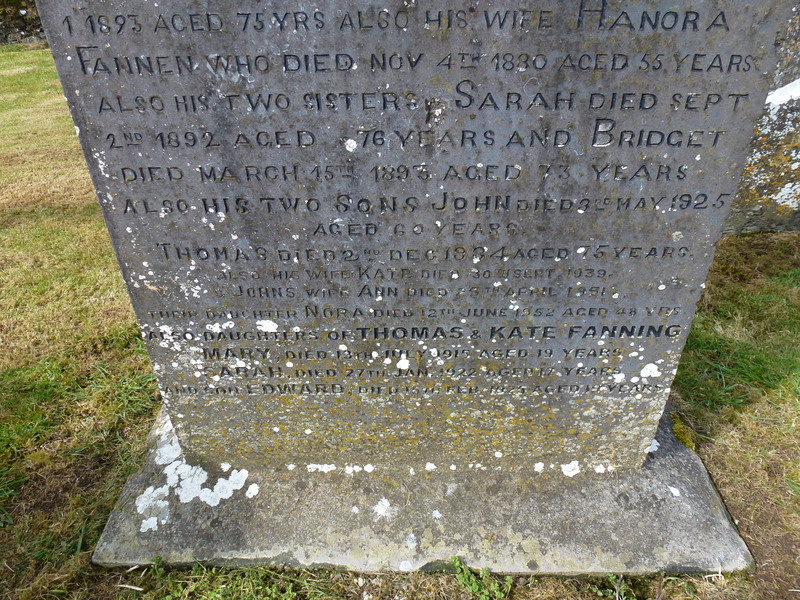 THOM FANNING who died March 23rd 1877 aged 77 years, also his wife WINIFRED CARROLL died June 1st 1870 aged 56 years, also his daughter CATHERINE KAVANAGH died August 6th 1899 aged 43 years, daughter ELLEN KAVANAGH died May 29th 1900 aged 22 years. MARY HANIGAN Alias FANNING of Glandale Parish Holycross. Erected by Rev William Hanigan, parish priest of Ballynahinchin in memory of his mother who died April 6th 1827 aged 80 years. 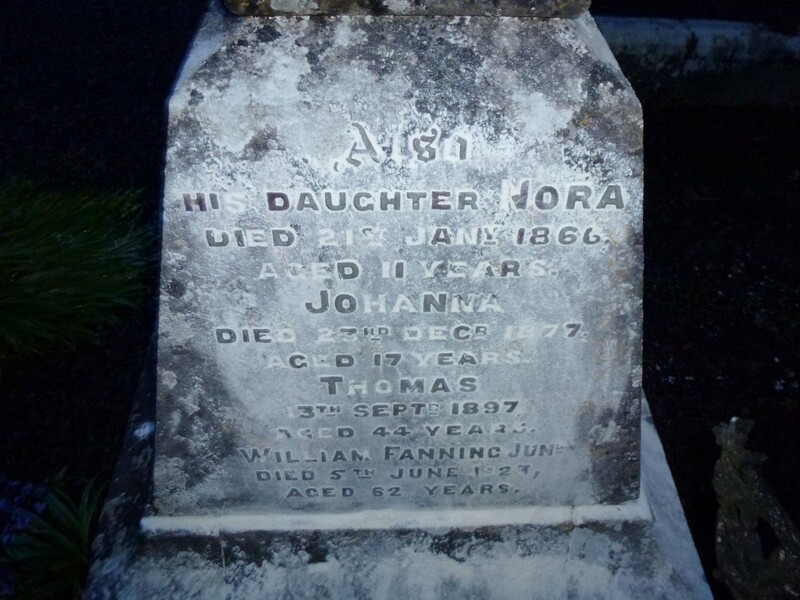 JOHN FANNING of Kilvacorus who died August 15th 1873 aged 31 years. (Margaret McGrath). JOHN FANNING died August 20th 1876 aged 90 years also his wife MARGARET nee RUSSELL died June 15th 1882 aged 86 years. JOSEPH FANNING, Drom died January 17th 1976, also his wife BRIDGET(Della) died February 19th 1986. Dwyer Mrs K.M. Erected by Michael Dwyer of Bouladuff in memory of his mother who died September 27th 1901 aged 33 years also Bridget Teresa who died December 30th 1899 aged 4 years also the above Michael Dwyer died December 2nd 1909. The above transcriptions are from Sue Grieves site. Erected to the memory of JOHN FANNING of Kilvilcorris who died 15th Aug 1873 aged 31. 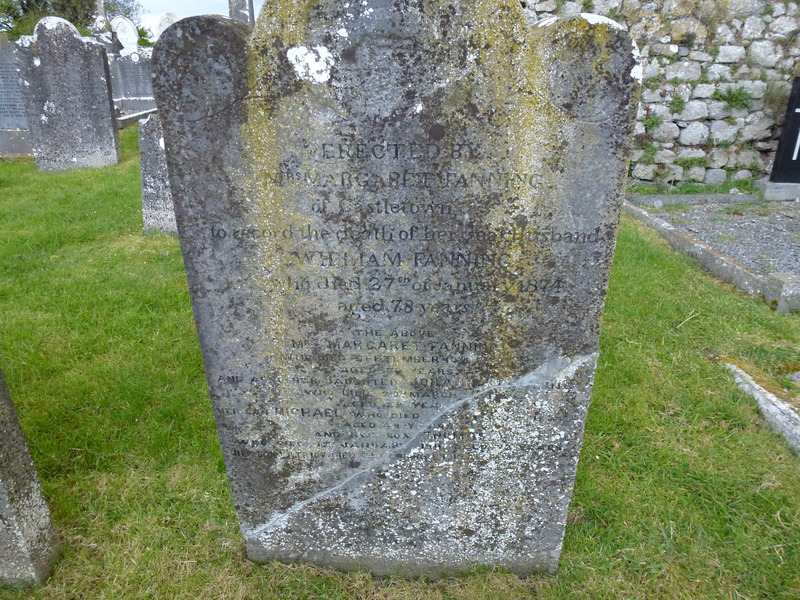 Also in memory of MARGARET MAGRATH, JOHN FANNING of Kilvilcoris, who died 20 Aug 1876 Aged 90 yrs. Also his wife MARGARET nee RUSSELL died June 15th 1882 aged 86 years. Looks to be on the other side of the above gravestone: And their son WILLIAM who died March 10 1905?, aged 70 yrs Also his son JOHN who died April 15? 18?? Aged 18? yrs Also LAURENCE FANNING ??????? ?????? Died June 19?? Aged 50?? Erected by his mother. From Jane Lyons From Ireland site but I can’t find these photos again. 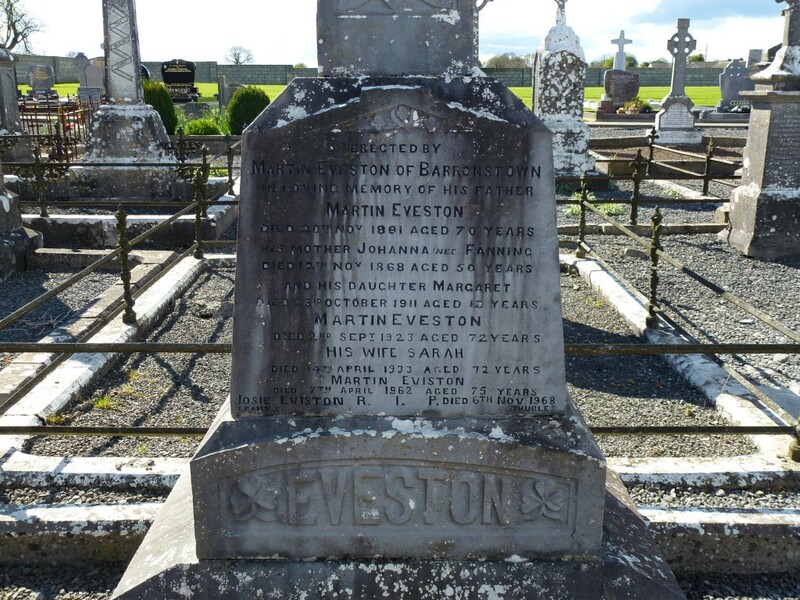 MARTIN EVESTON, erected by Martin Eveston of Barronstown in memory of his father who died Nov 20 1891 aged 70 years, his mother JOHANNA NEE FANNING died Nov 12 1868 aged 50 years, his daughter MARGARET died Oct 23 1911 aged 12 years, MARTIN EVESTON died Sept 2 1923 aged 72 years, his wife SARAH died April 14 1933 aged 72 years MARTIN EVISTON died 7 April 1962 aged 75, JOSIE EVISTON died Nov 6 1968. 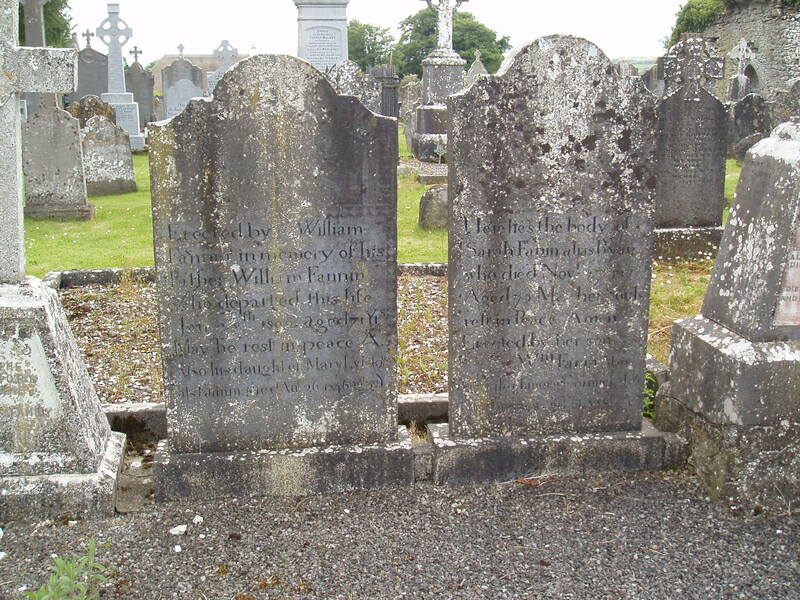 WILLIAM FANNING of Clondoty died 27.7.1908 aged 89 years, his wife CATHERINE died 3.9.1875 aged 44 years, PATRICK died 5.11.1906 aged 42 years. 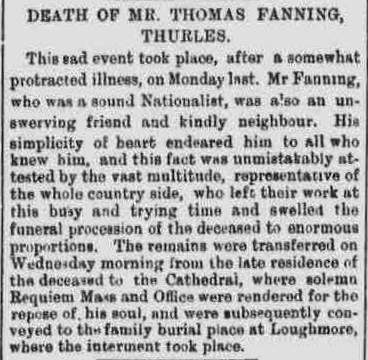 The Freeman’s Journal 17th Sept 1897 published an obituary for Thomas Fanning who was married to Ellen Sheehan and died age 44 on the 13th of Sept 1897. CATHERINE FANNING , erected by WILLIAM FANNING in memory of his wife Catherine who died 13th September 1875 aged 44 years, also his son PATRICK died 15 Nov 1906 aged 42 years, the above WILLIAM died 27 July 1908 aged 89 years, son JAMES died 3rd Sept.1912 aged 40 years, his son JOHN died 14th Oct 1932 aged 68 and his daughter NORA died 21 Jan 1866 aged 11, JOHANNA died 23rd Dec 1877 aged 17, THOMAS died 13th Sept. 1897 aged 44 years. WILLIAM JNR died 5th June1923 aged 62 years. His grandson WILLIAM died 10th Sept 1942 aged 32. 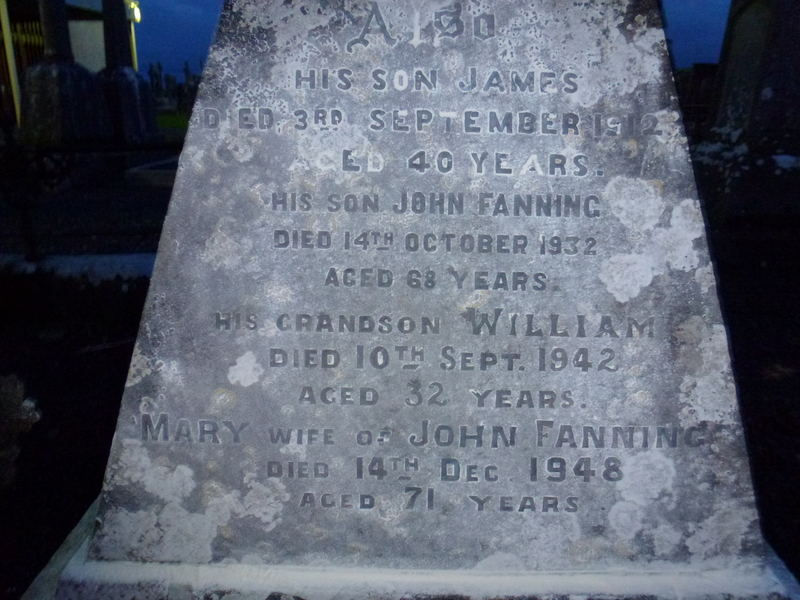 MARY wife of John Fanning died 14th Dec 1948 aged 71 years. James Fanning who is on the above gravestone is actually buried in Liverpool Ford Cemetery in England. His gravestone is below. He was a victualler in Liverpool and married to Ellen Wills from Newry Co Down. They had four children but three died in infancy. Thomas Ryan was Ellen’s second husband. In today’s money the money he left to his wife is a considerable amount, about 45,000 pounds. He was a successful businessman. JAMES FANNING died 3.1.1831 aged 74 years, erected by Catherine Fanning and Sarah Clarke, his wife and daughter. Loughmore Gr. JUDY FANNING, erected by JOHN FANNING in memory of his daughter Judy who died 23.10.1828 aged 4 years. His son THOMAS died 1835 aged 13 years and his daughter MARY died 21.11.1840 age 14. WILLIE A FANNING of Shanbally House, Moycarkey died 11.2.1925 aged 22 years, his mother JOHANNA died 16.5.1948 aged 72 years, his father EDWARD died 12.9.1948 aged 80 years. Brother PATRICK died Jan 4 1995 aged 86 and sister MAURA 30 July 1984 and brother JOHN 19 Jan 1981. TIMOTHY FANNING of Gurthnaha died 30 Jan 1916 age 83. 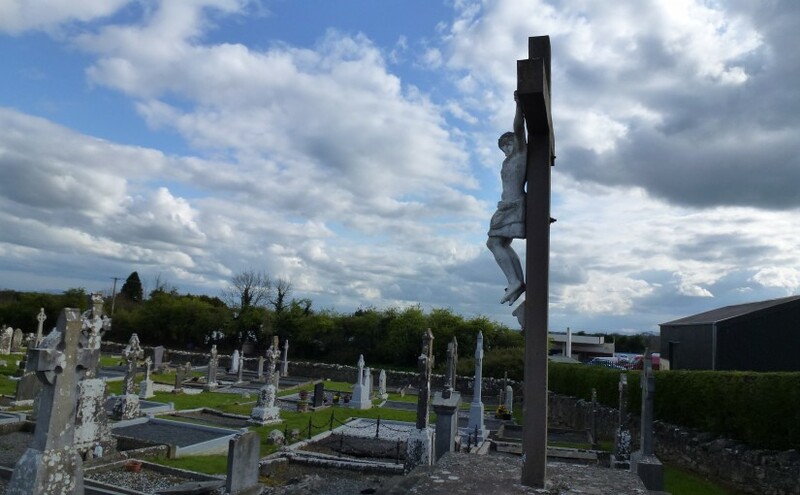 Buried in Loughmore Cemetery. Son of John and Honora Fanning. 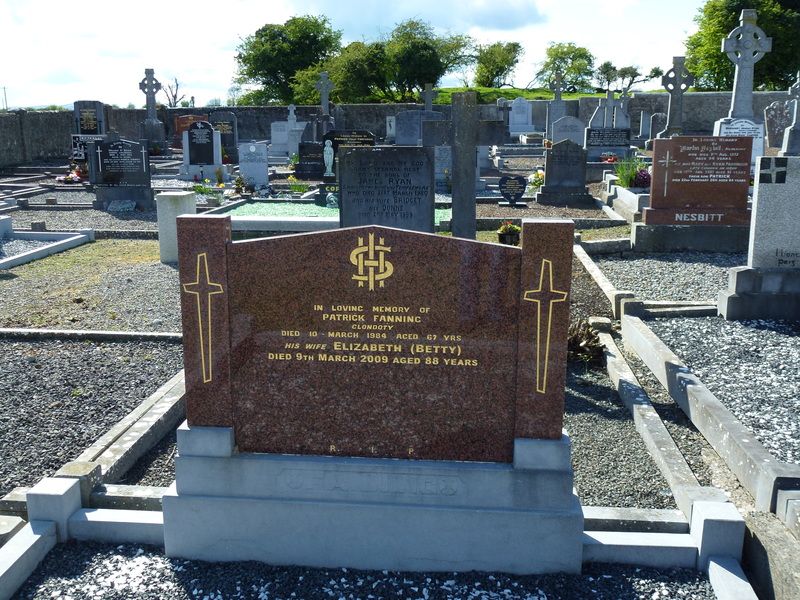 PATRICK FANNING of Clondoty died 10 Mar 1984, age 67, and is buried in Loughmore RC Cemetery. 1.Erected by MARGARET FANNING of Castletown to record the death of her dear husband WILLIAM FANNING who died 27th of January 1874 aged 78 years. The above Mrs Margaret Fanning who died Sept 10_ aged 70 and also her daughter JOHANNA FANNING who died 20th March 1871 Aged 28 years. Her son MICHAEL who died October 9 1886, aged 48 and her son THOMAS who died 13th Jan 1911, aged 72. 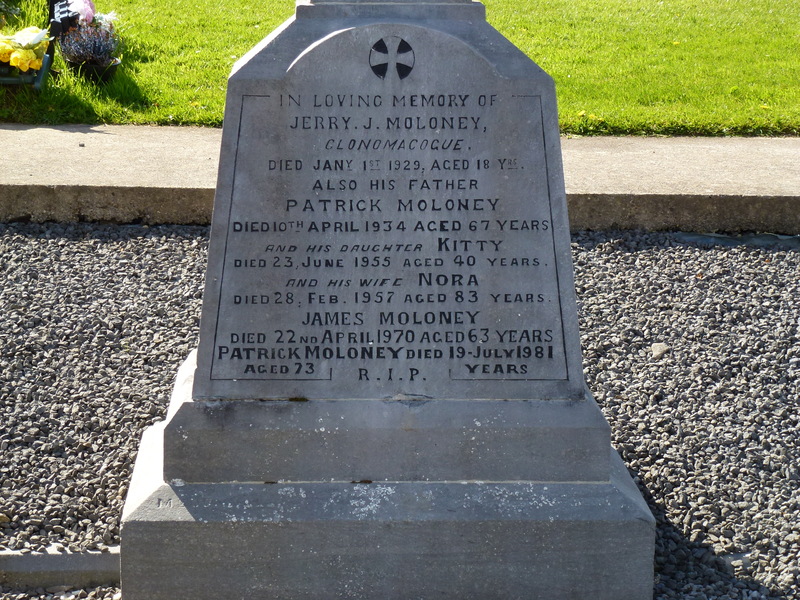 Her son PATRICK died 8th February 1915, Aged 88. The civil death record for the above Michael Fanning has the date as 10 Mar 1887, age 47 and cause of death paralysis for 9 months.